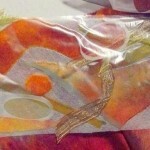 This is a water-soluble stabilizer that comes in two parts. 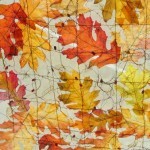 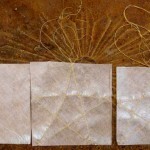 The first is a white, fabric-like paper with a sticky side that is protected by a glossy, brown, sheet. 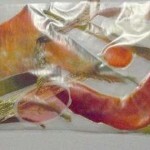 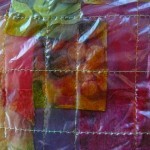 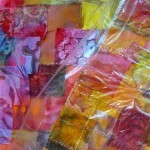 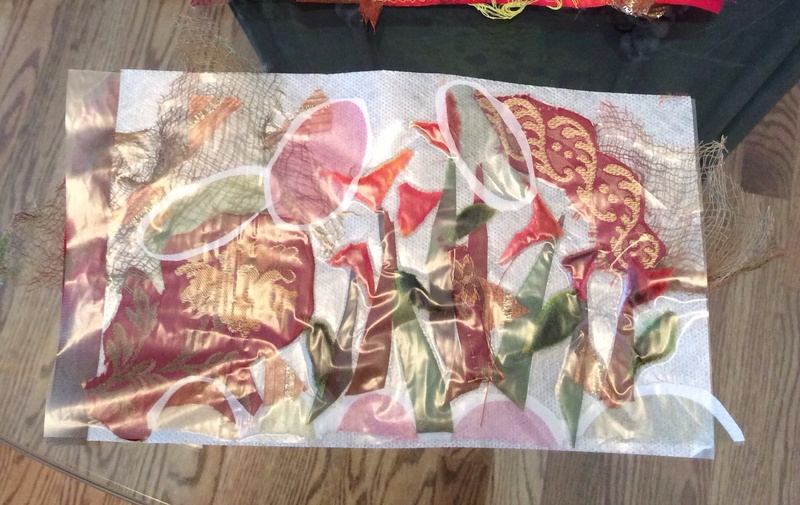 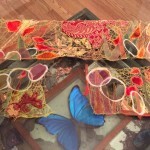 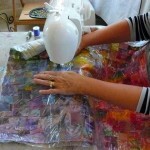 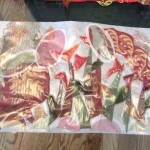 The second is a transparent sheet that will lie on top to make stitching a breeze. 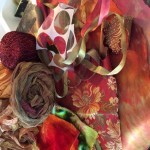 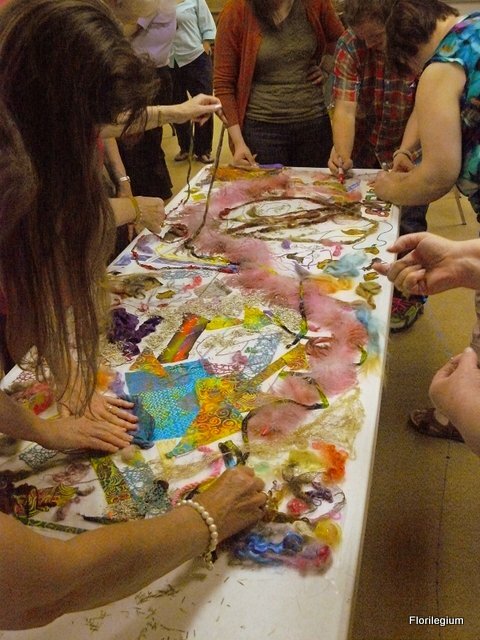 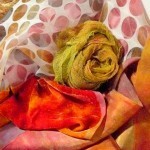 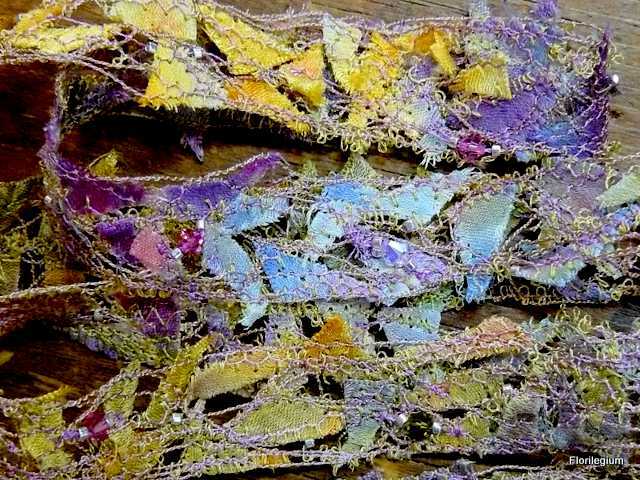 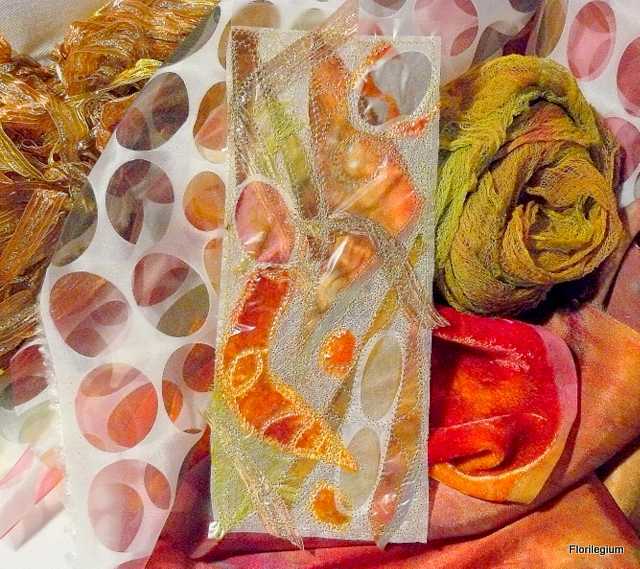 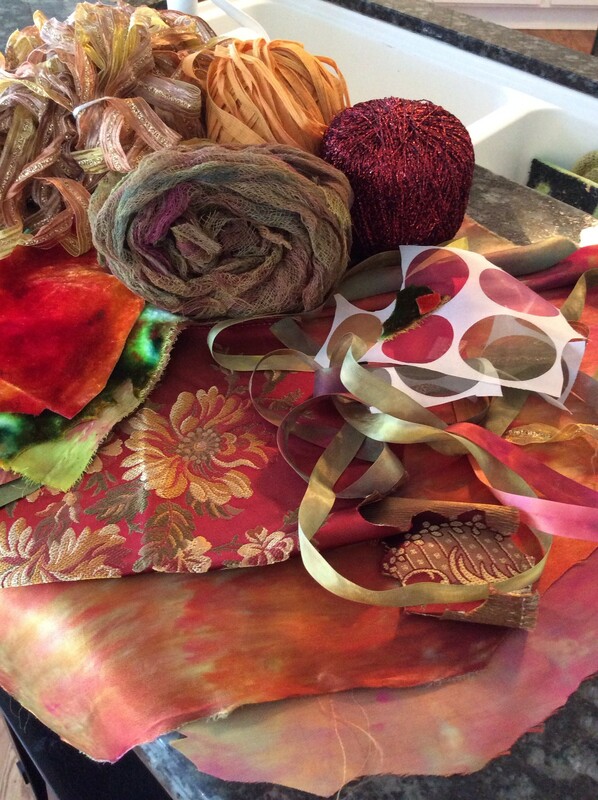 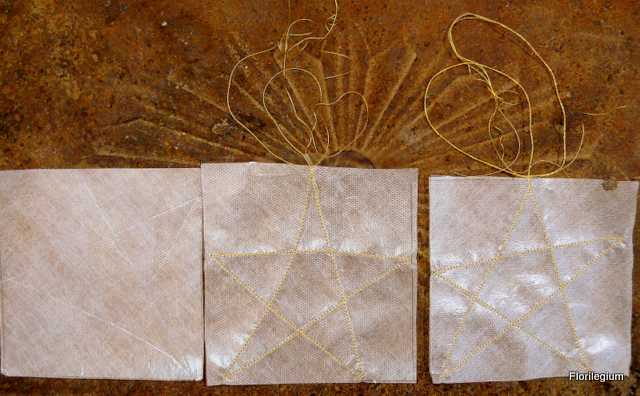 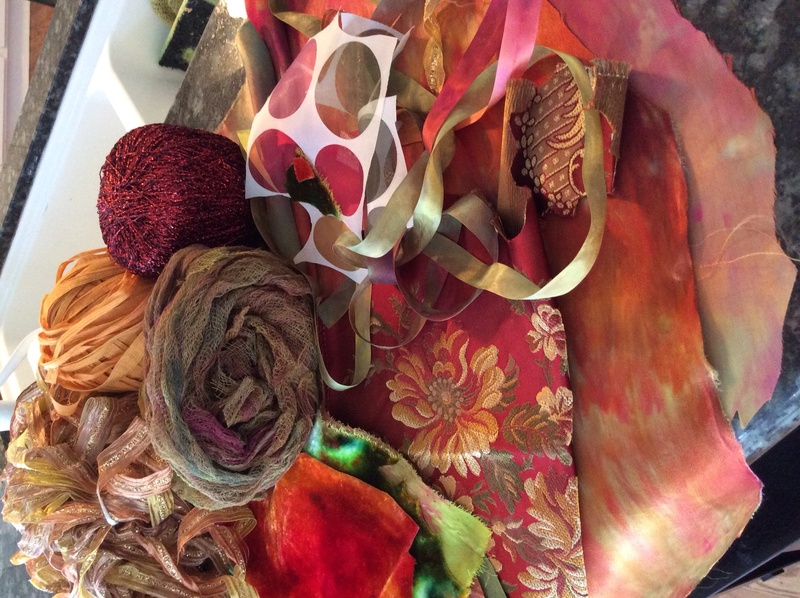 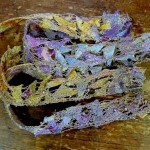 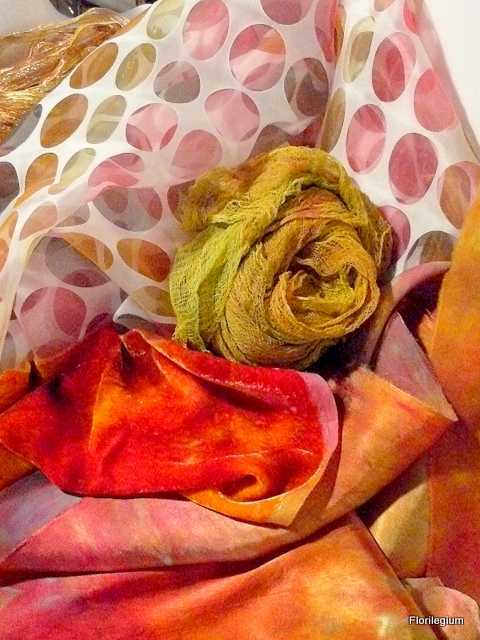 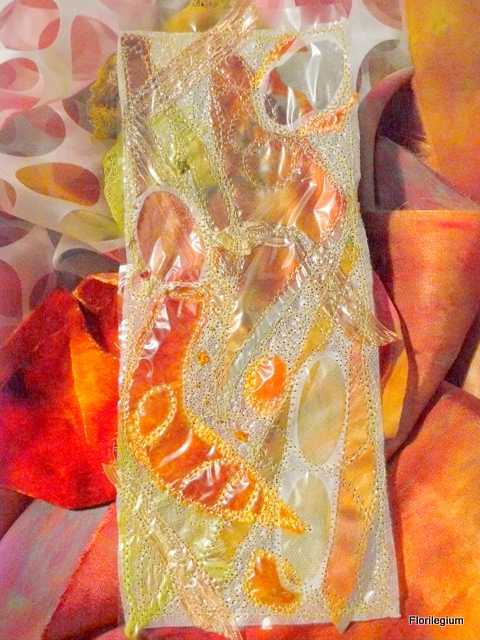 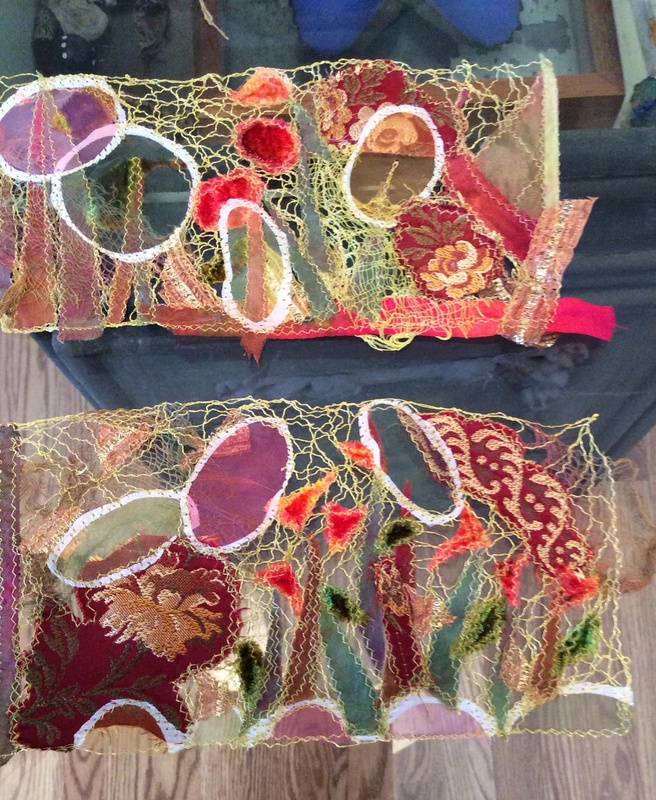 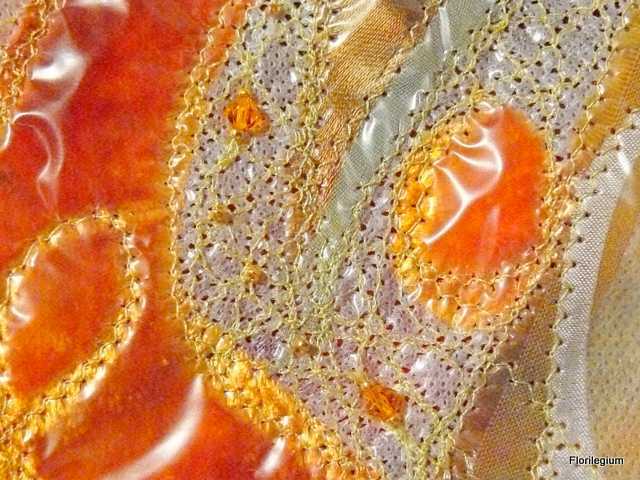 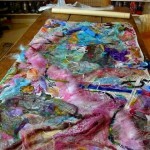 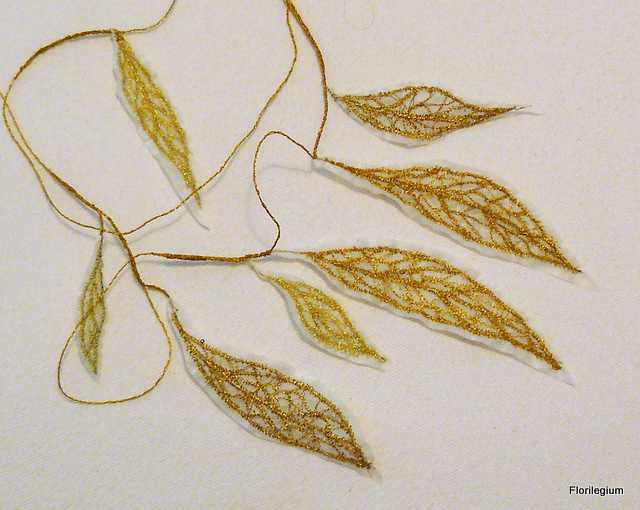 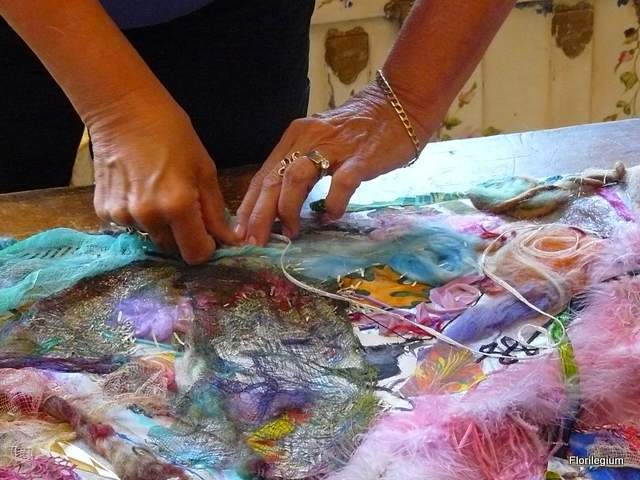 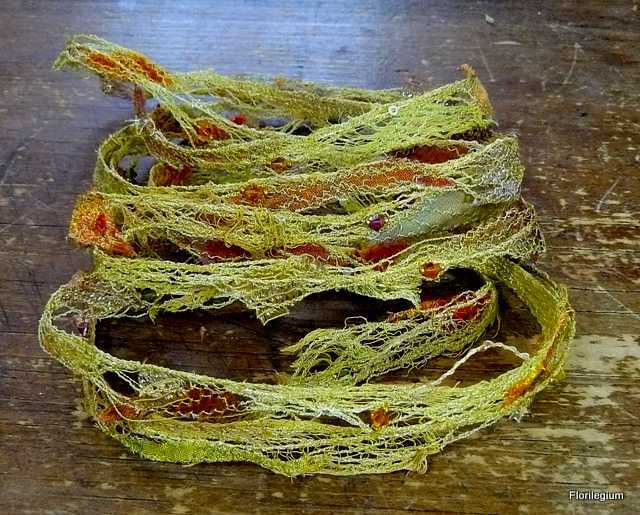 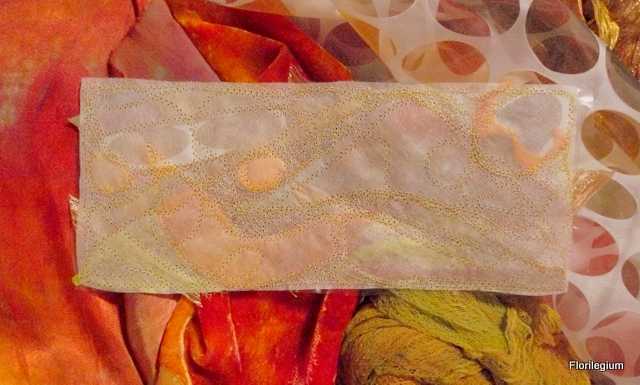 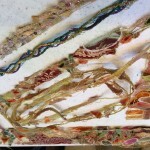 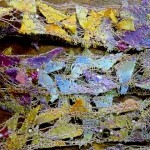 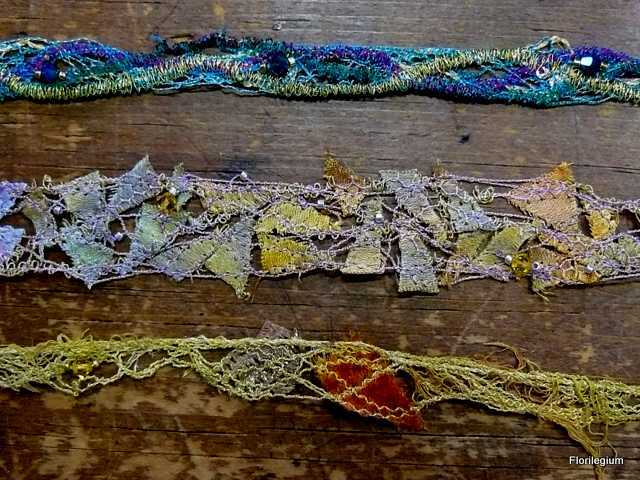 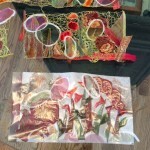 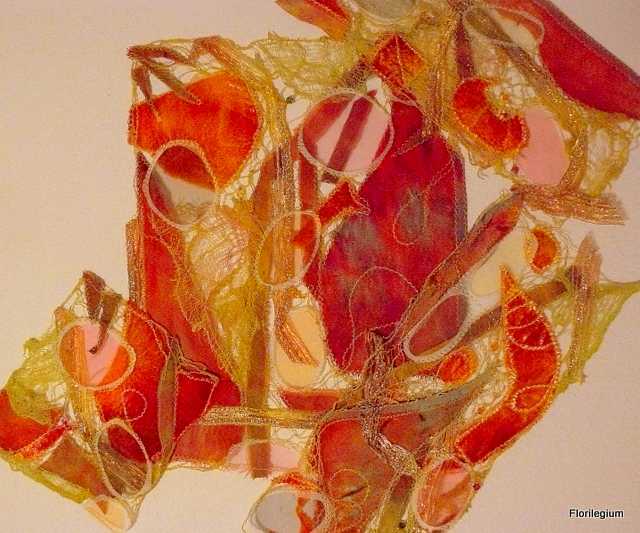 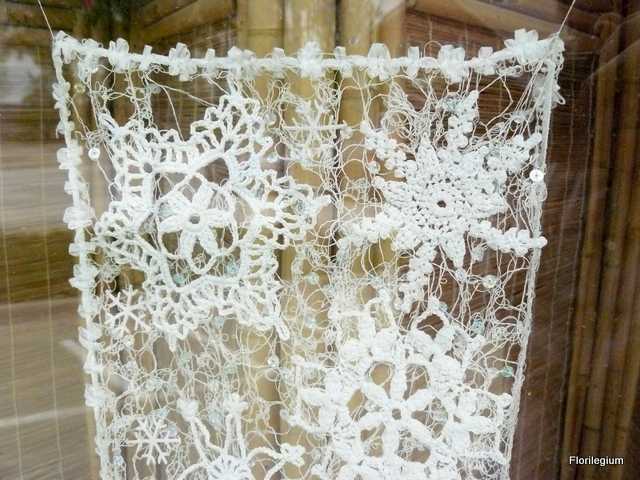 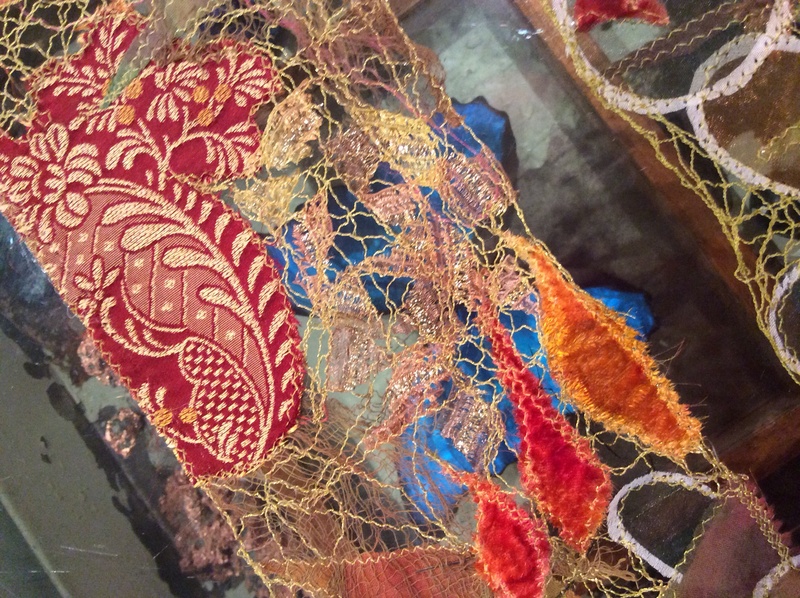 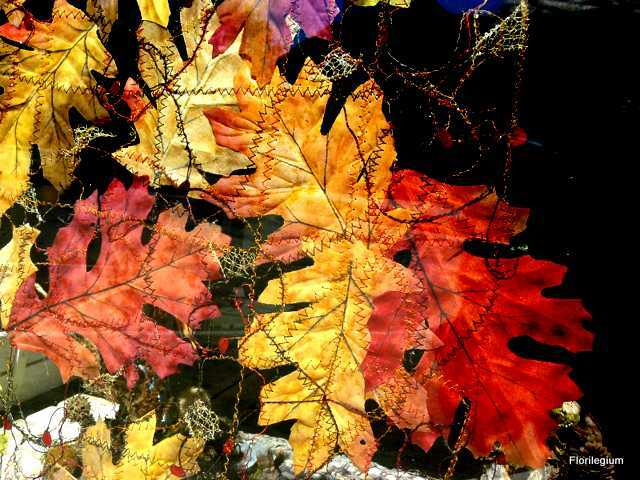 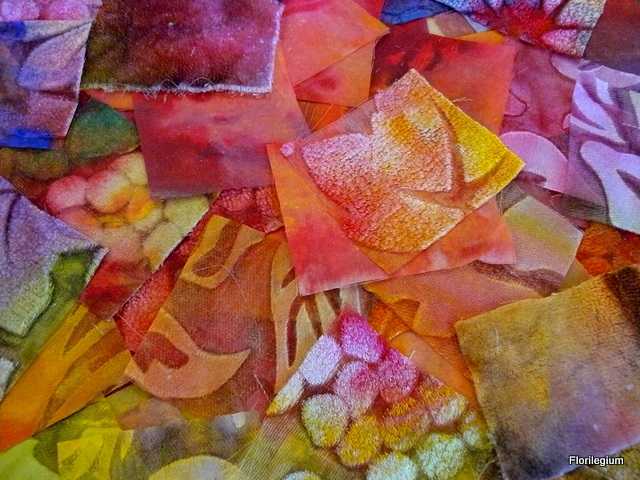 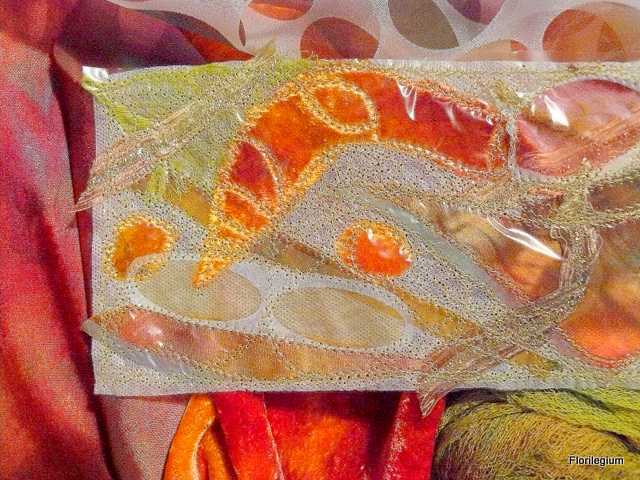 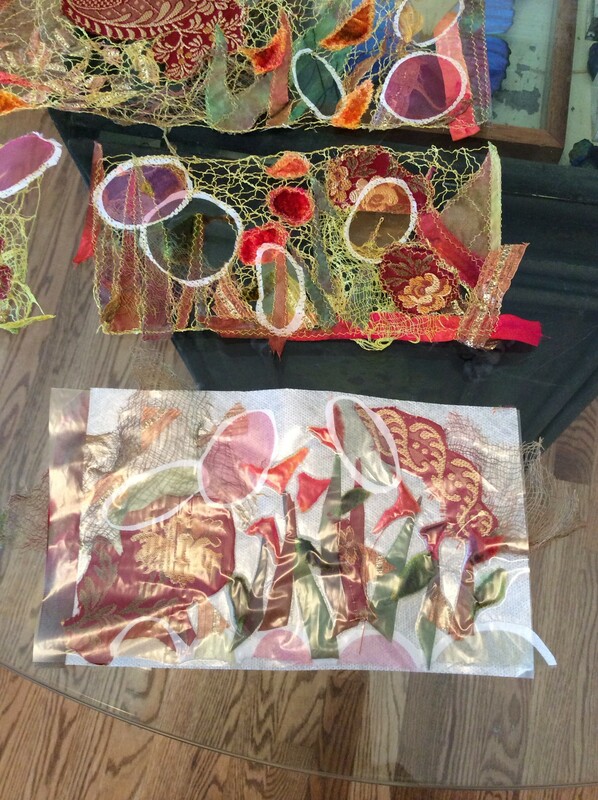 Freelace paper is used to hold fibers, ribbons, fabrics, feathers, (or anything else that can be stitched or rinsed) until they can be stitched together into a unique piece of lace or fabric. 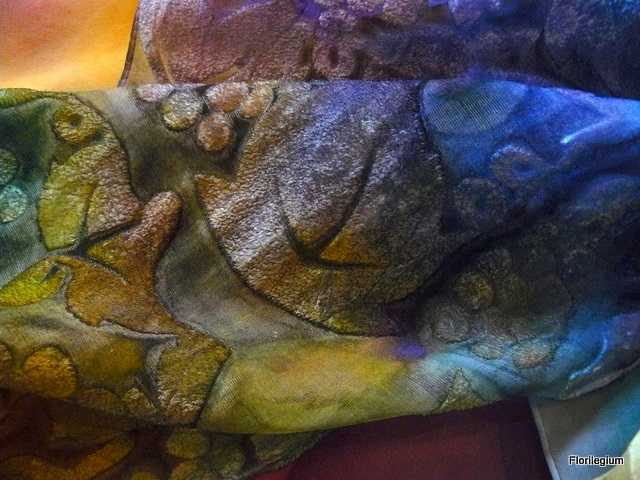 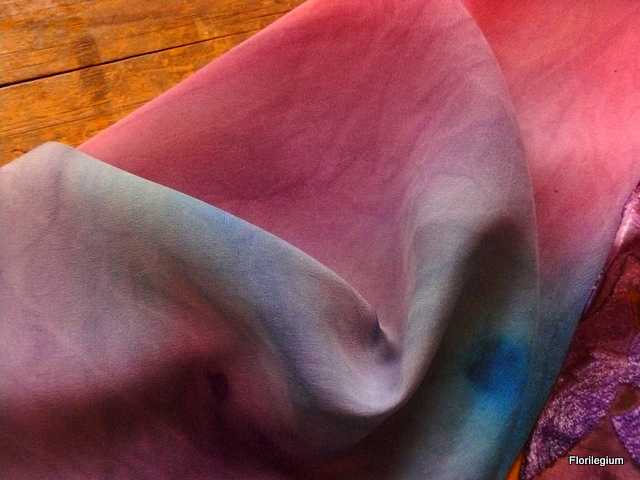 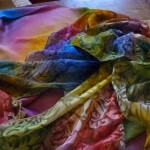 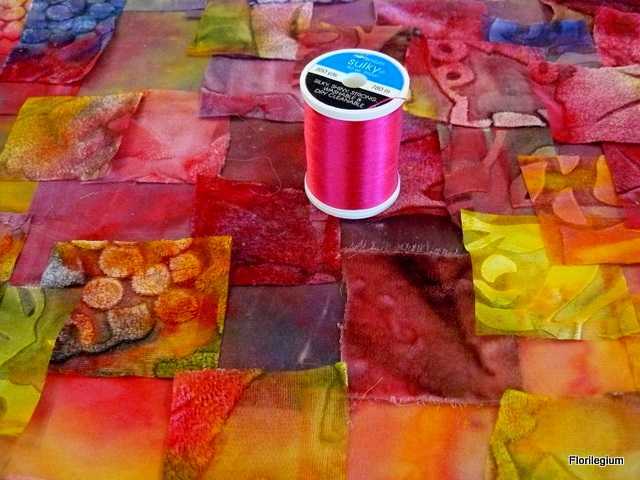 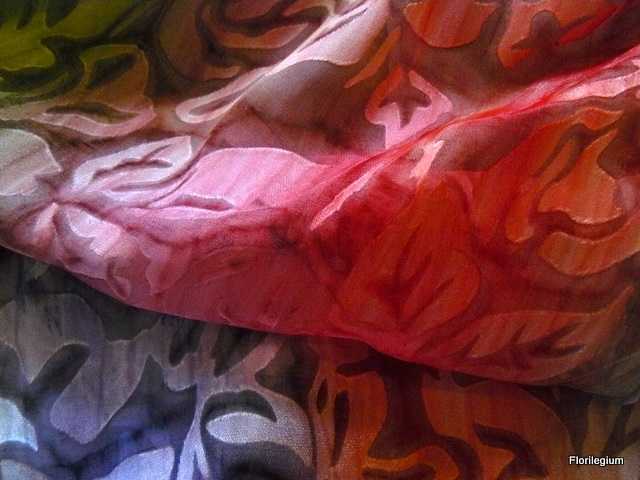 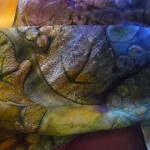 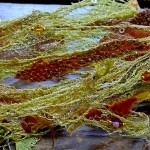 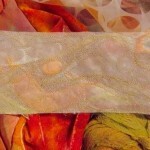 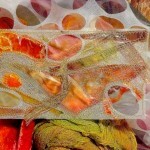 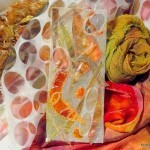 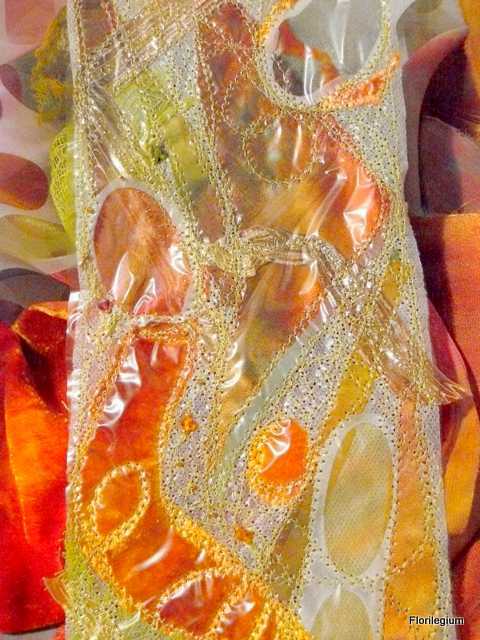 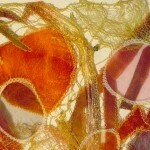 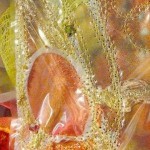 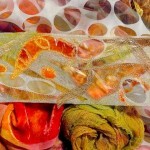 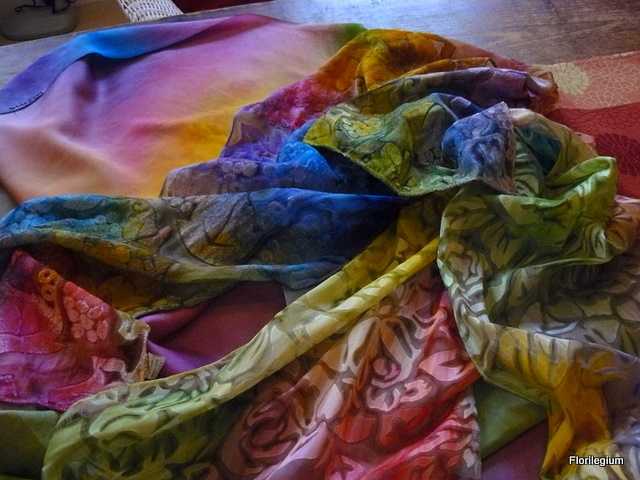 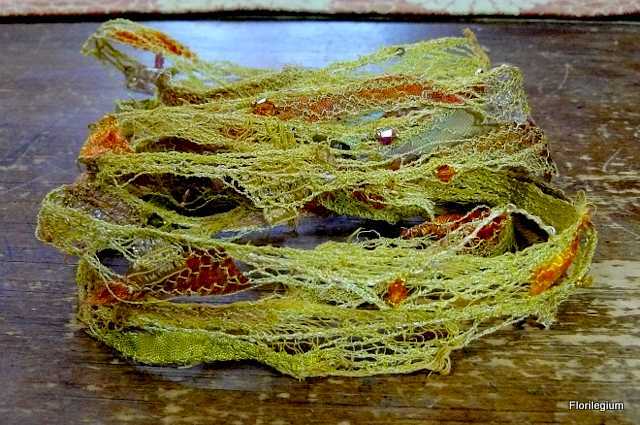 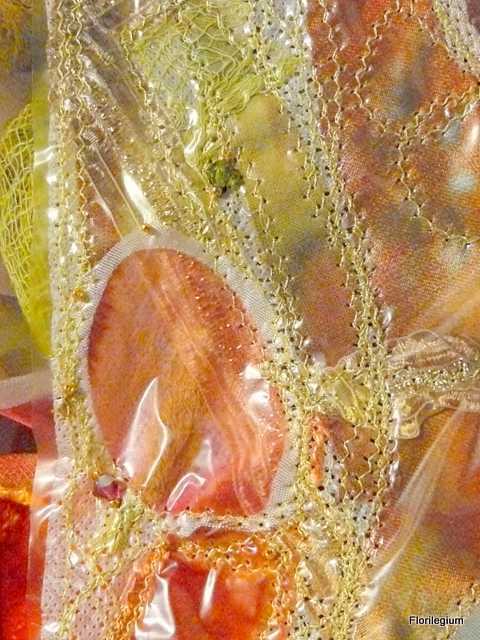 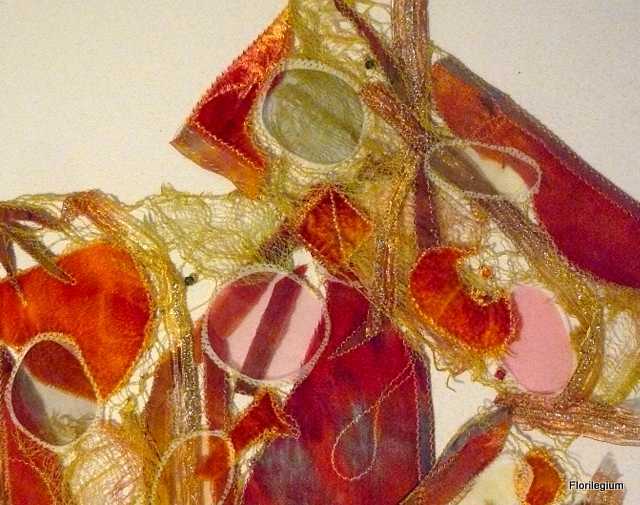 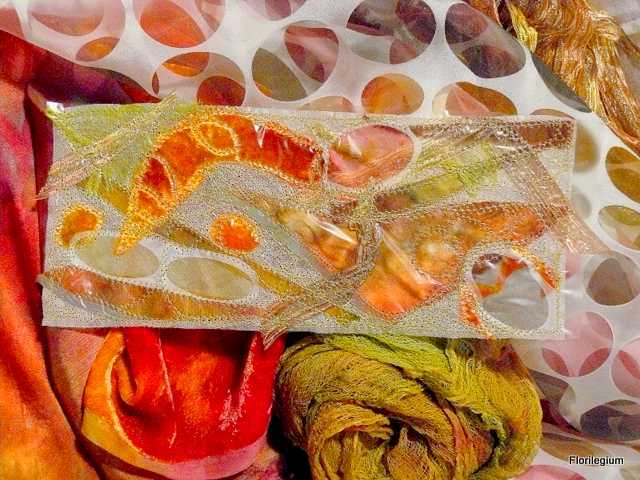 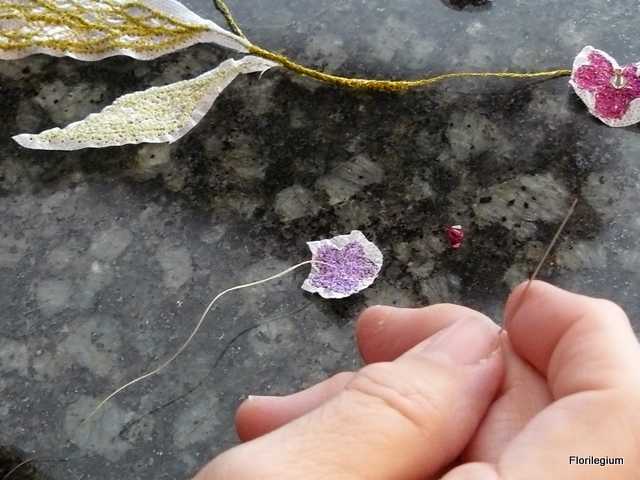 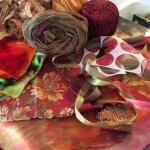 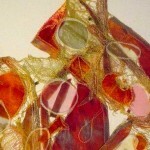 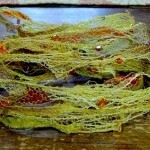 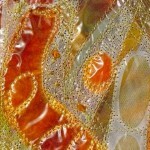 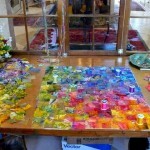 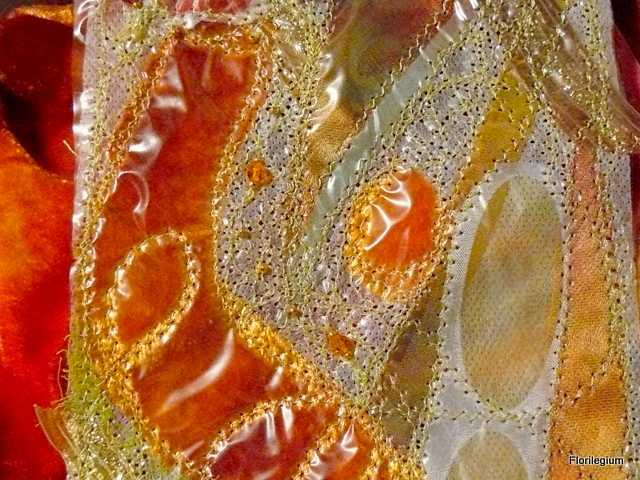 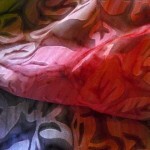 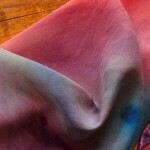 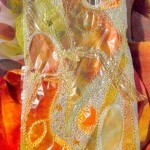 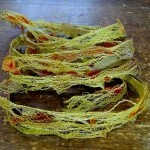 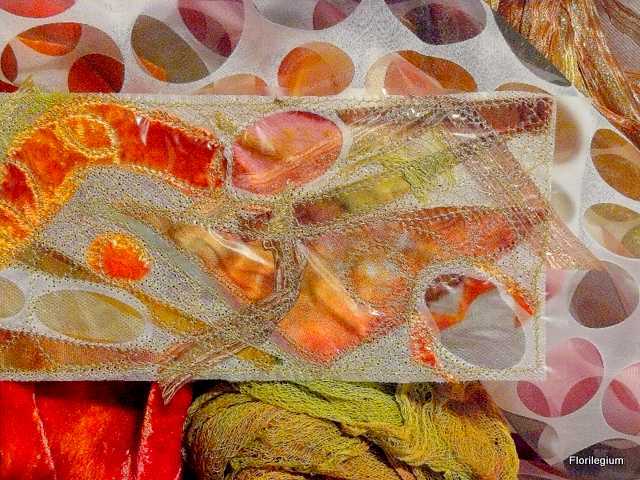 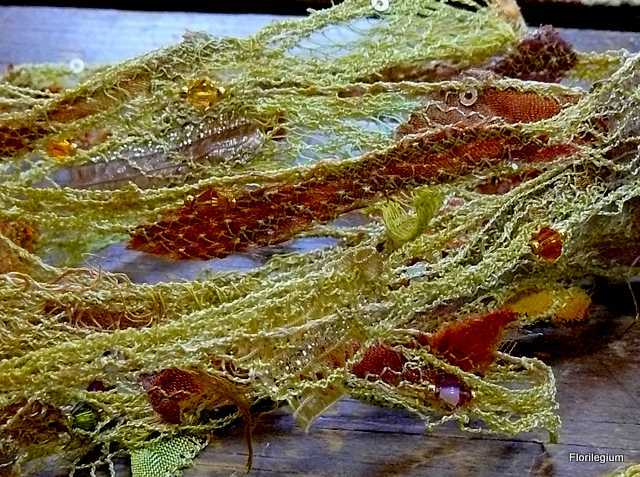 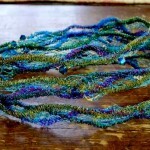 It will allow you to create the airiest lace or more opaque, multi-faceted fabrics. 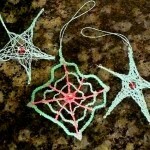 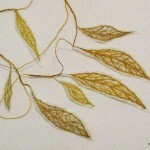 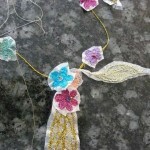 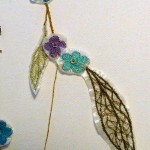 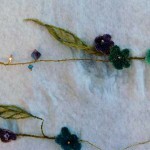 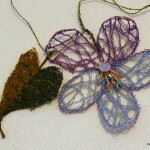 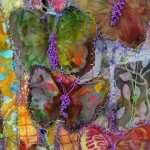 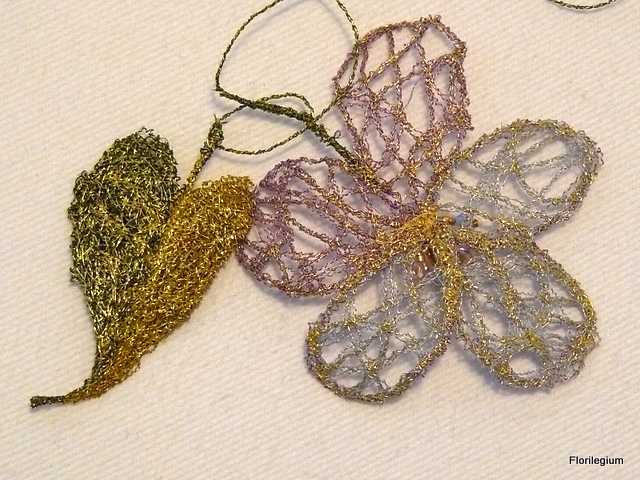 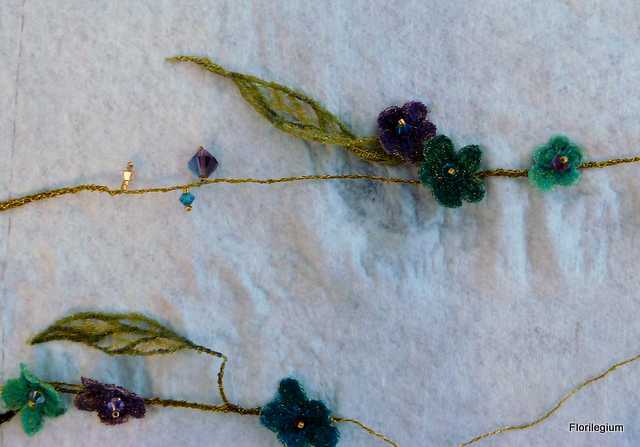 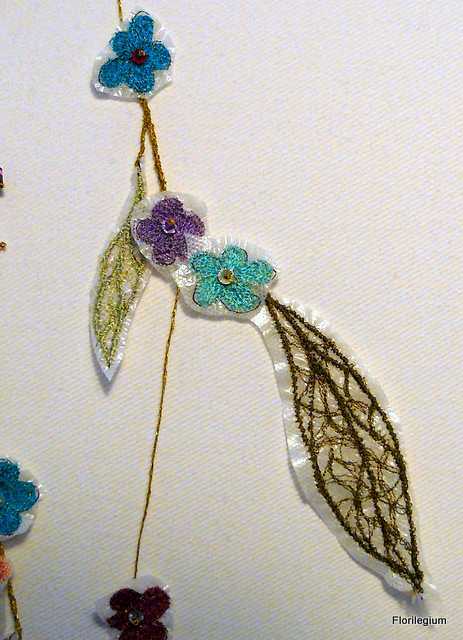 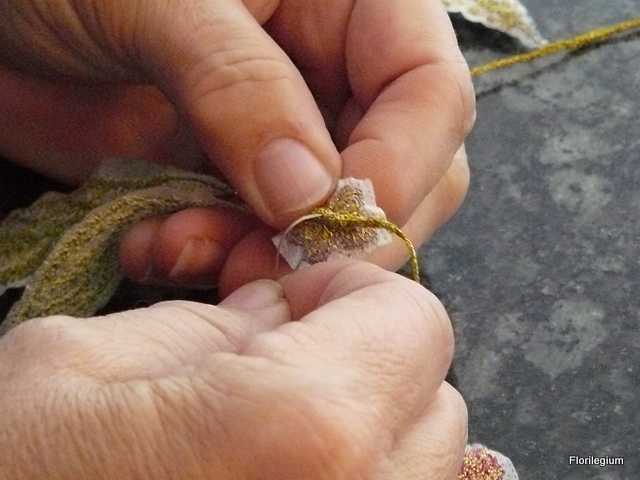 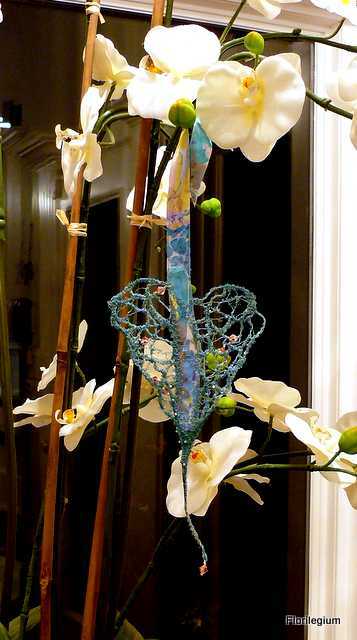 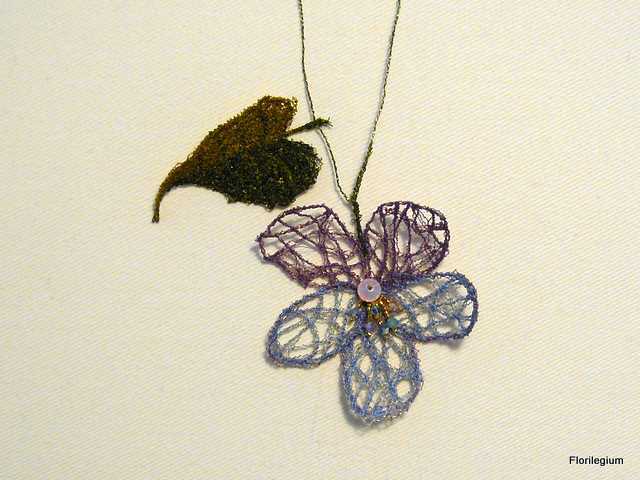 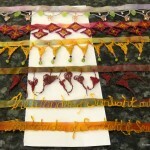 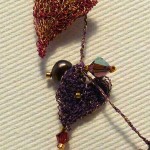 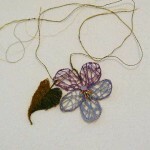 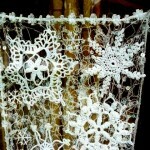 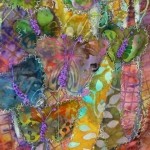 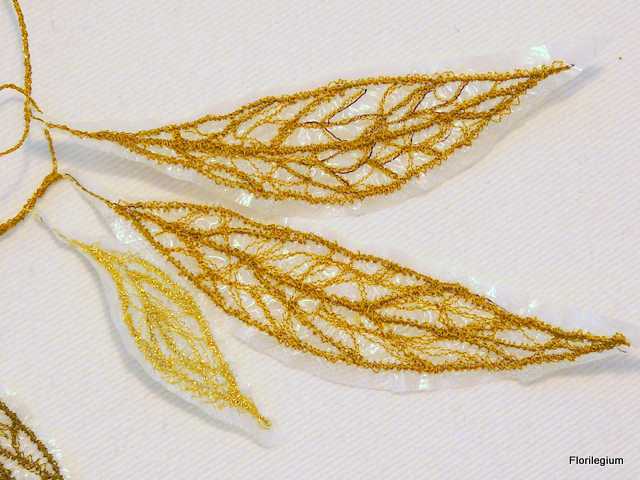 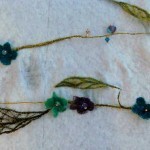 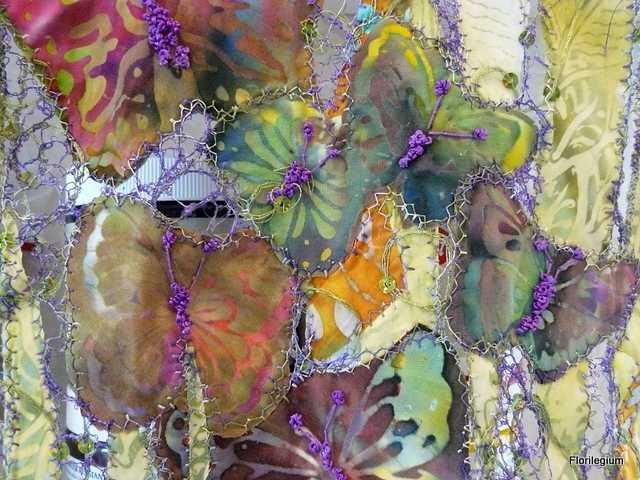 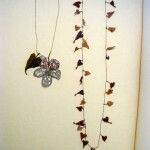 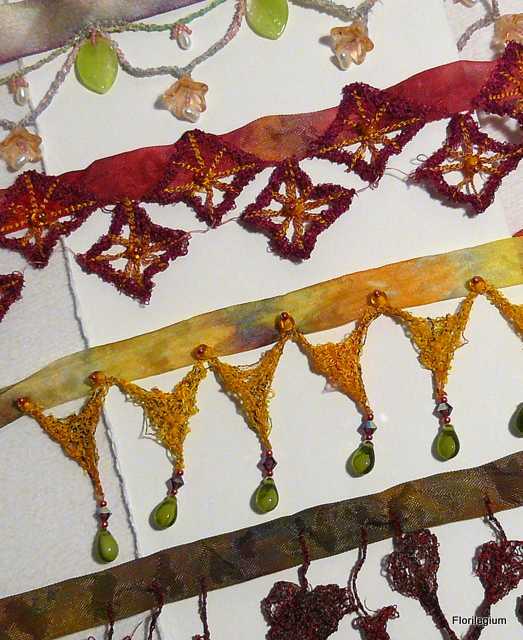 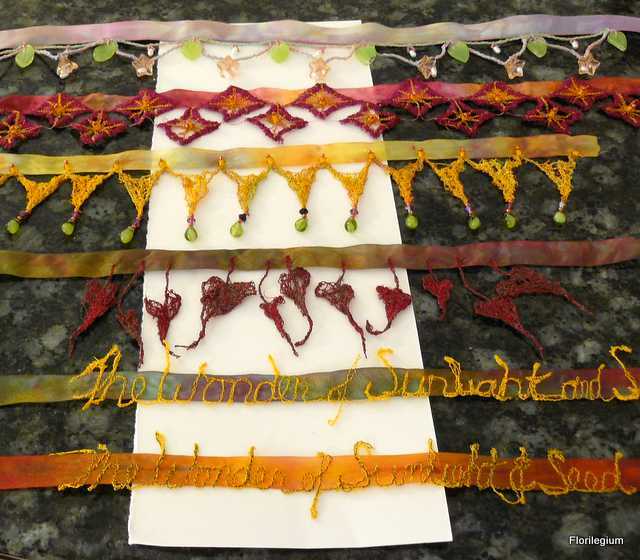 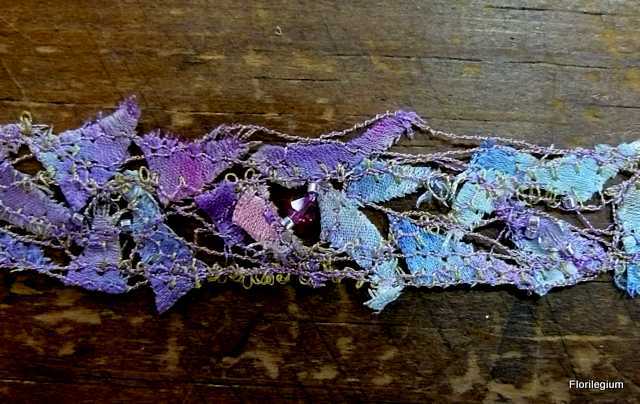 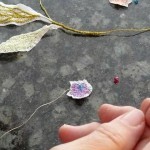 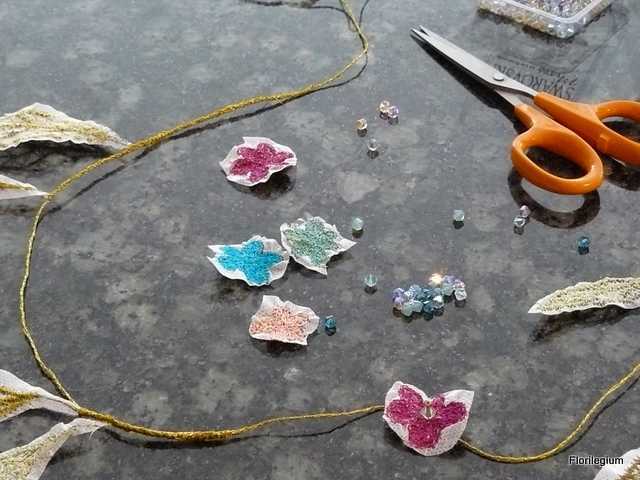 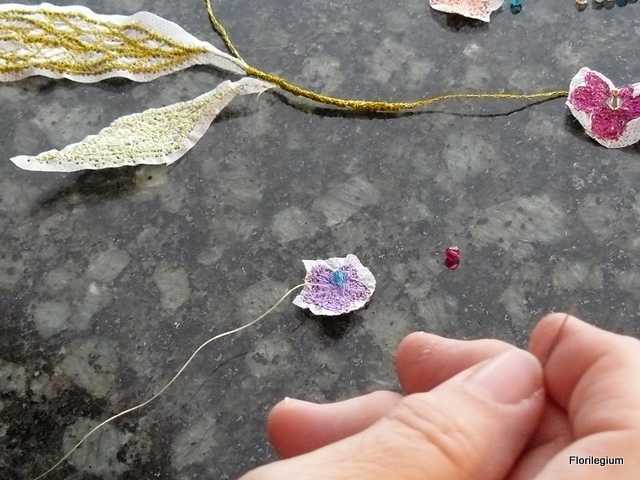 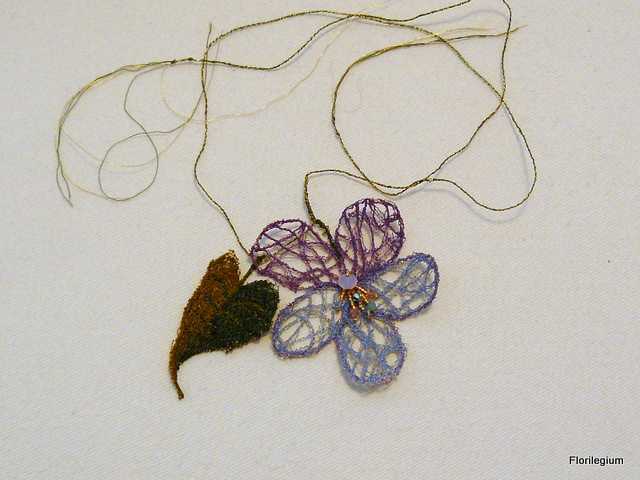 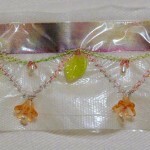 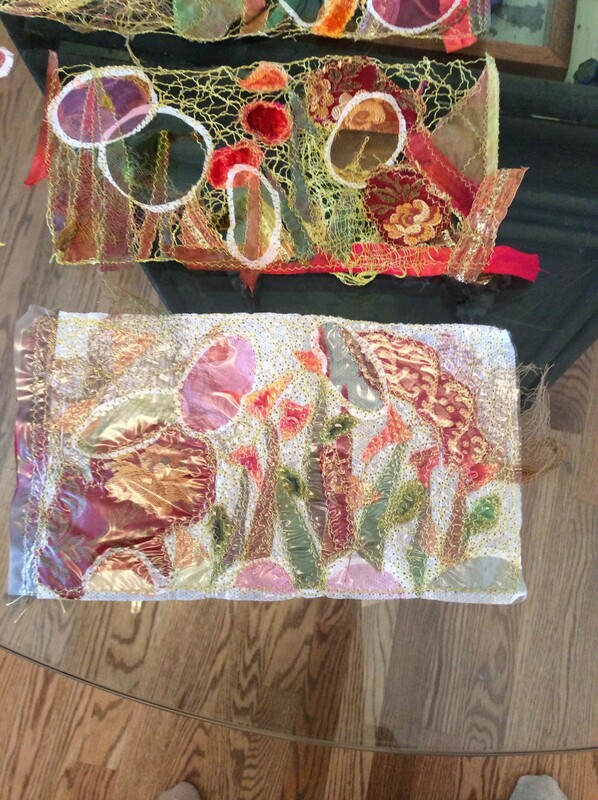 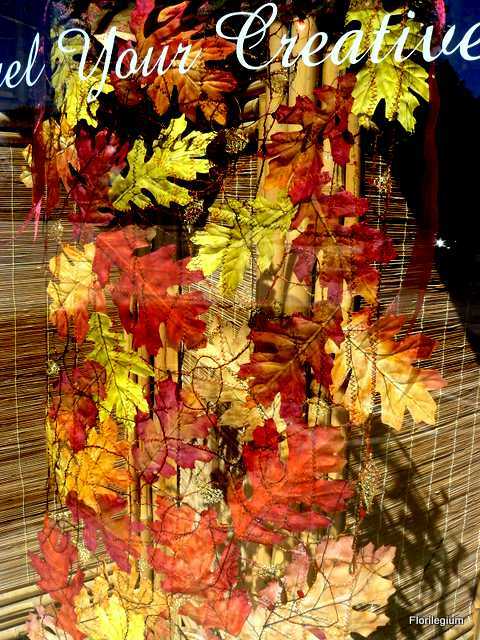 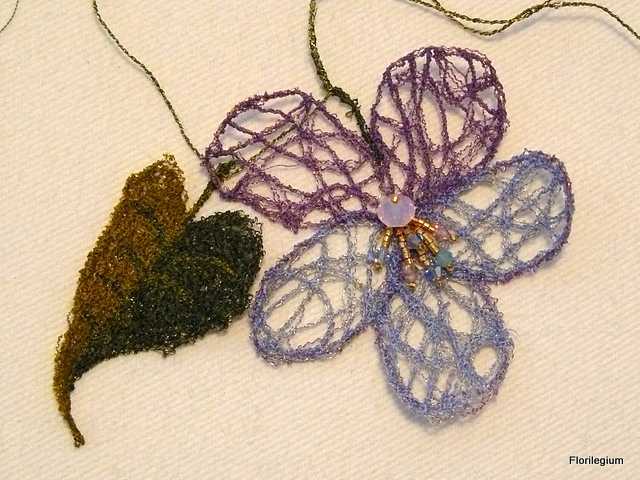 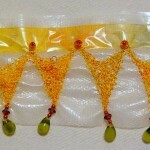 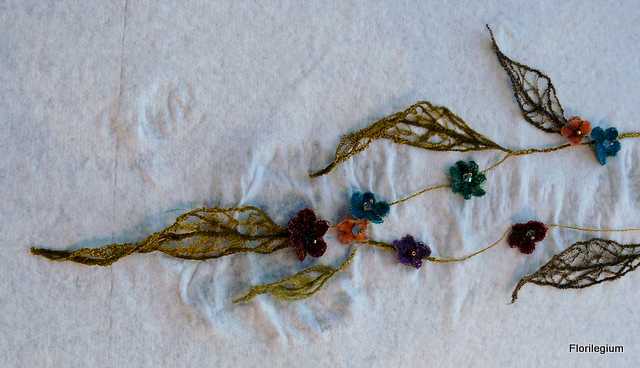 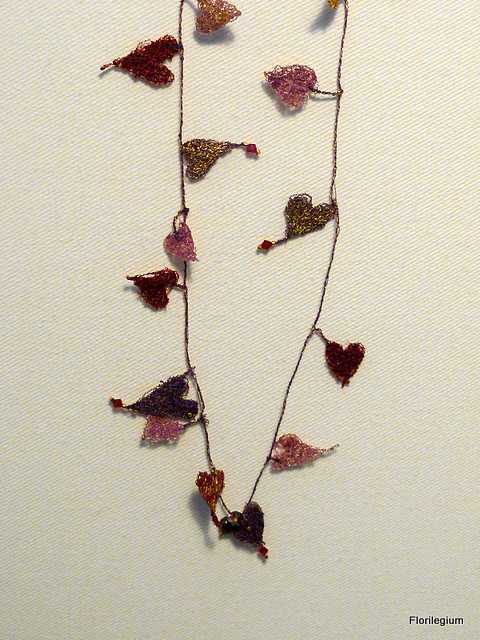 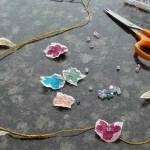 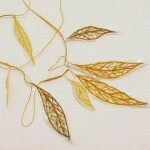 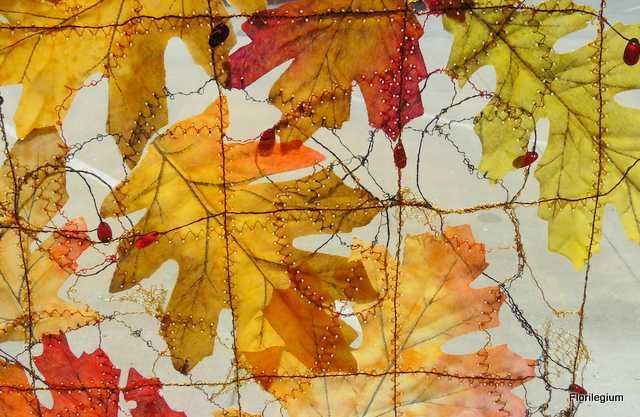 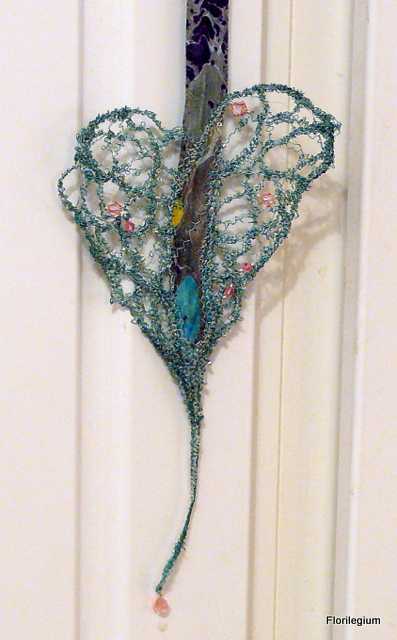 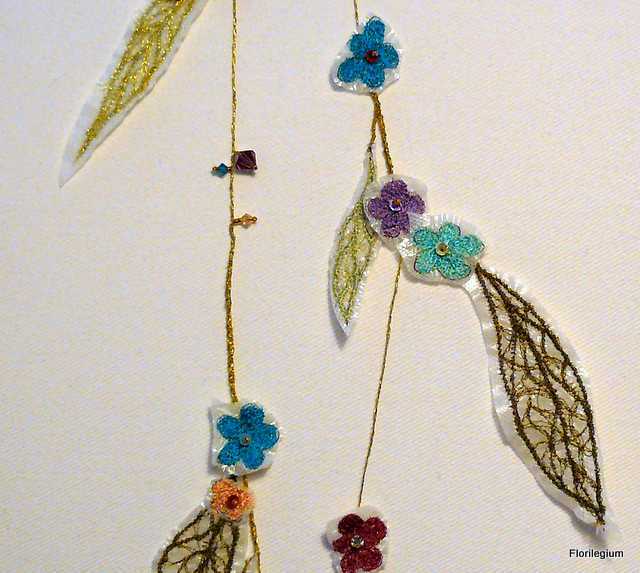 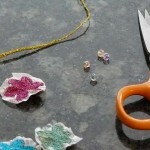 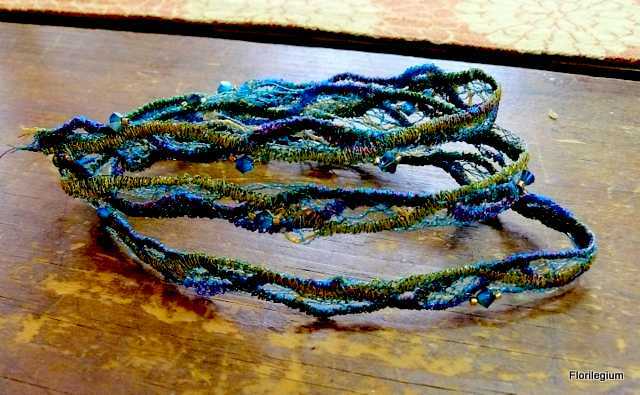 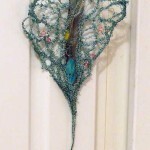 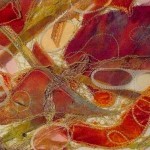 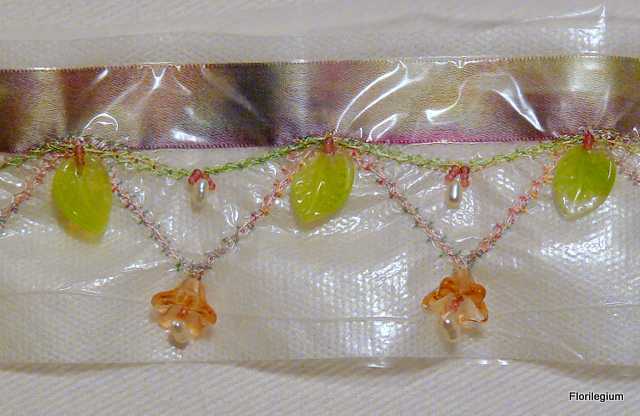 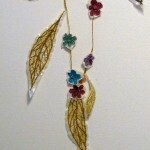 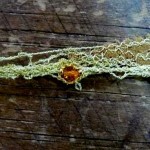 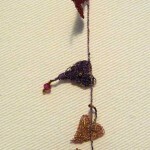 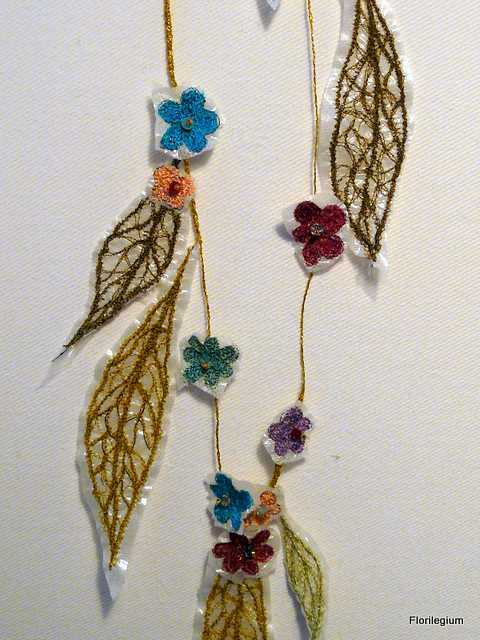 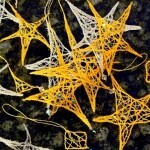 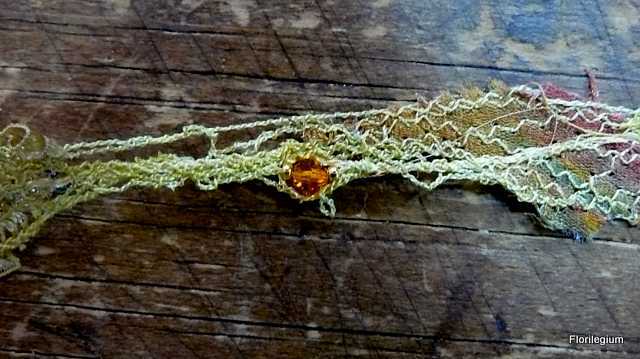 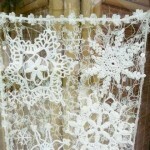 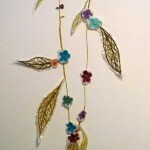 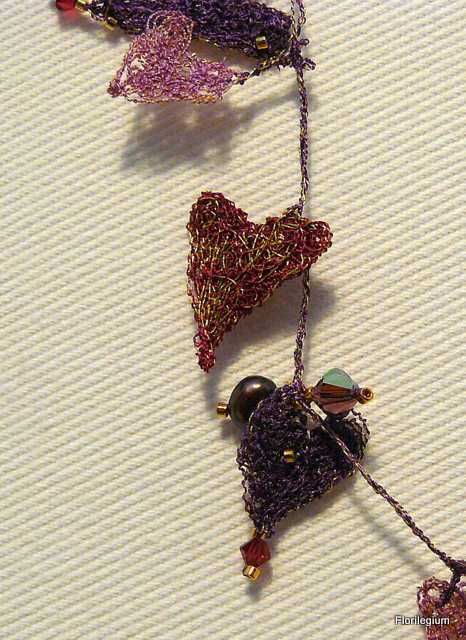 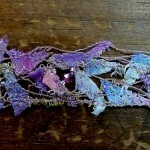 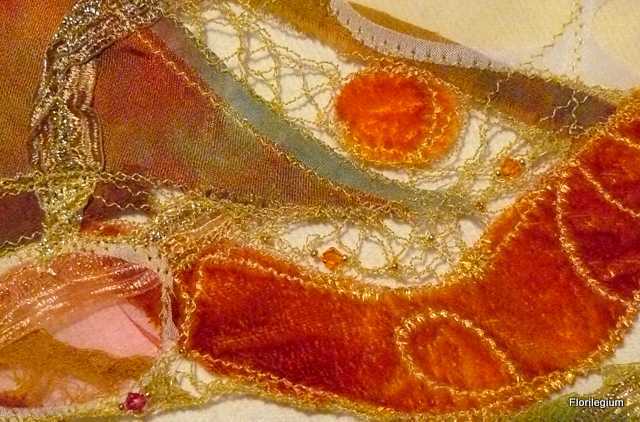 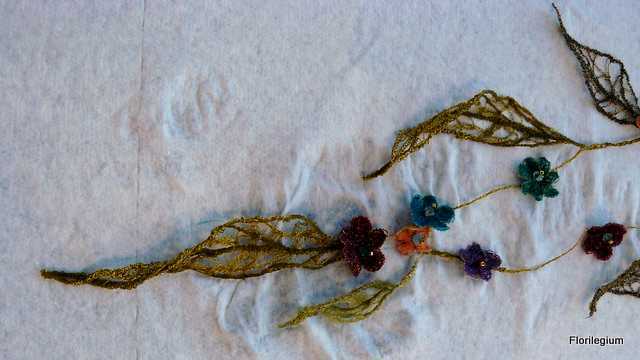 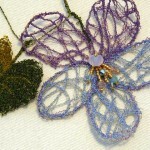 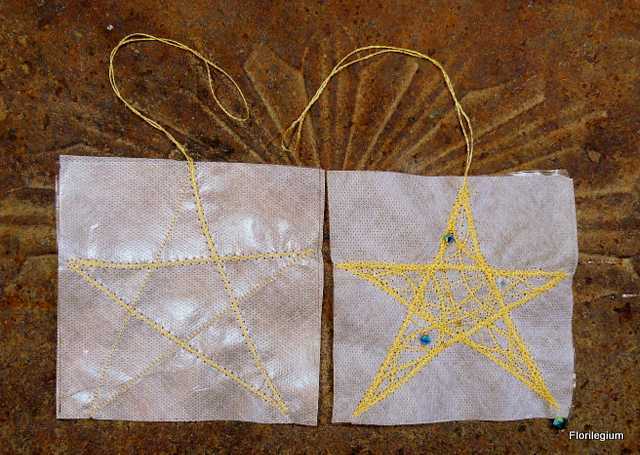 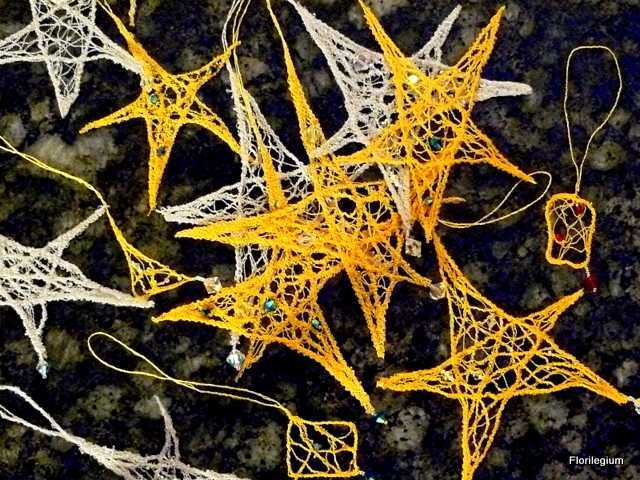 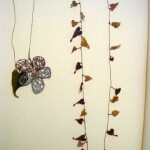 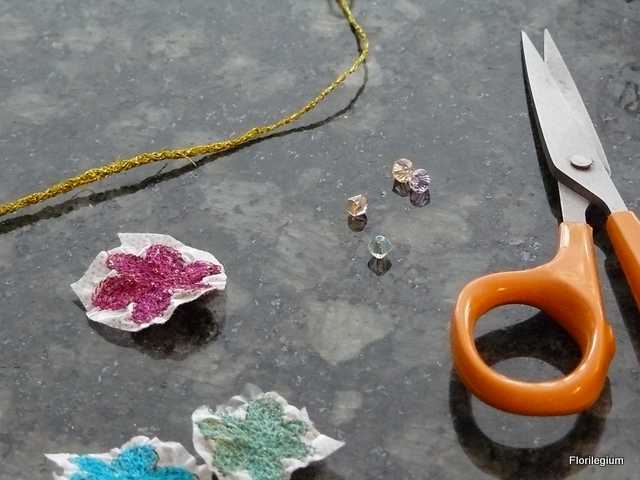 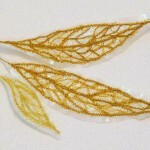 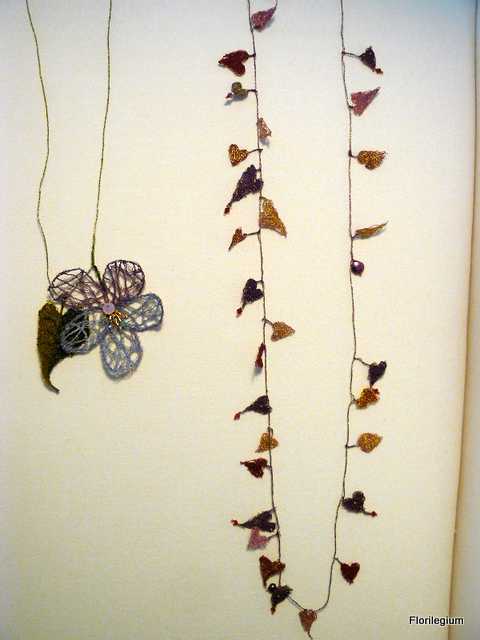 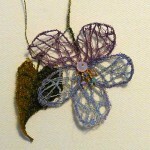 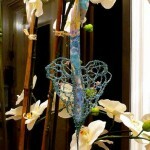 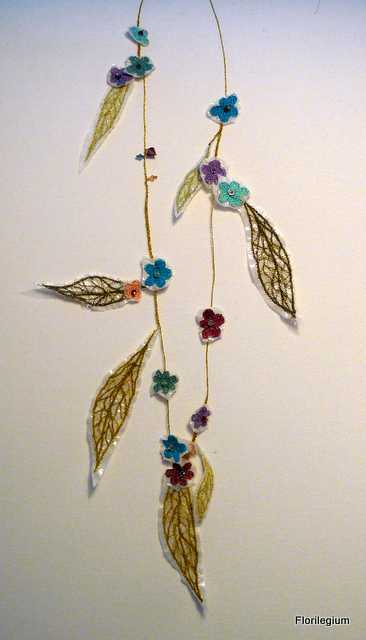 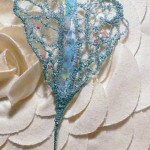 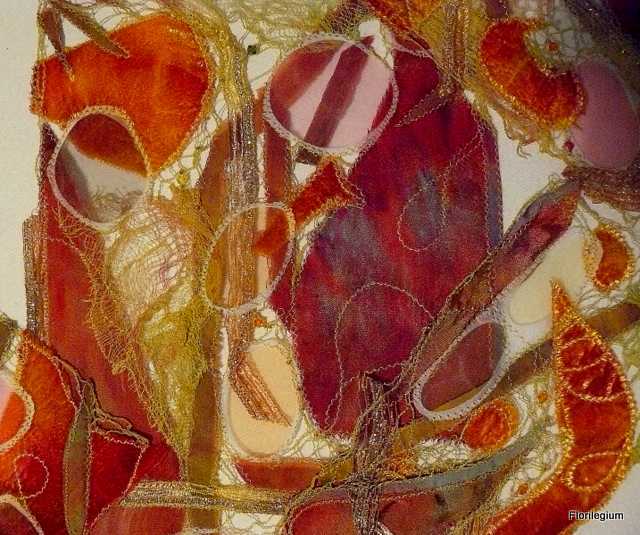 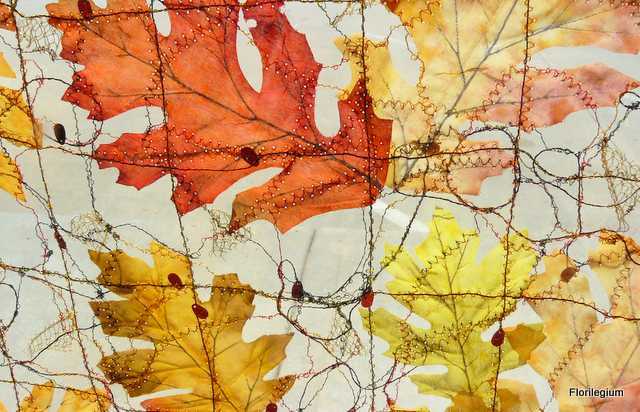 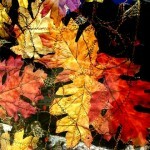 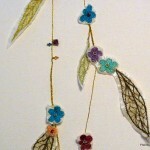 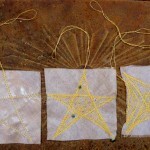 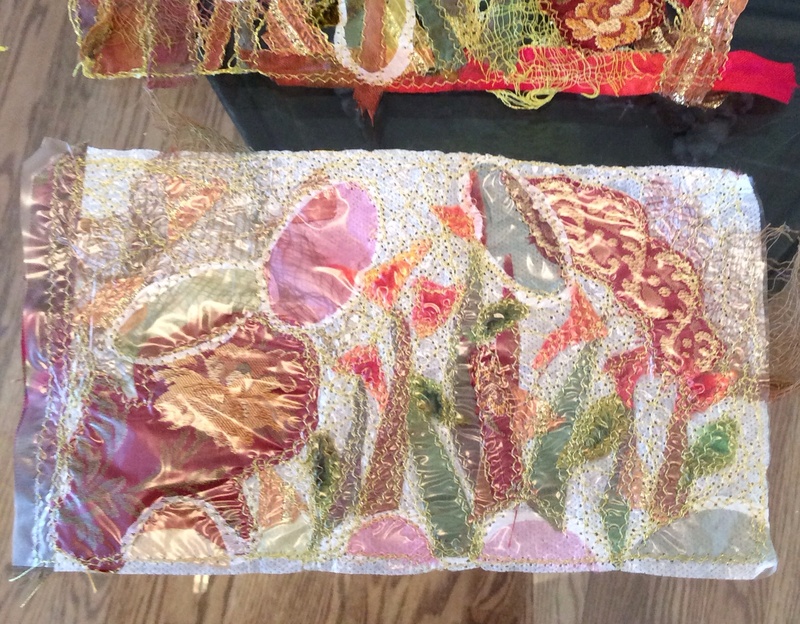 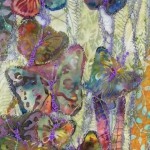 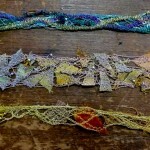 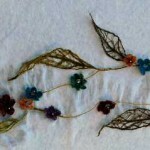 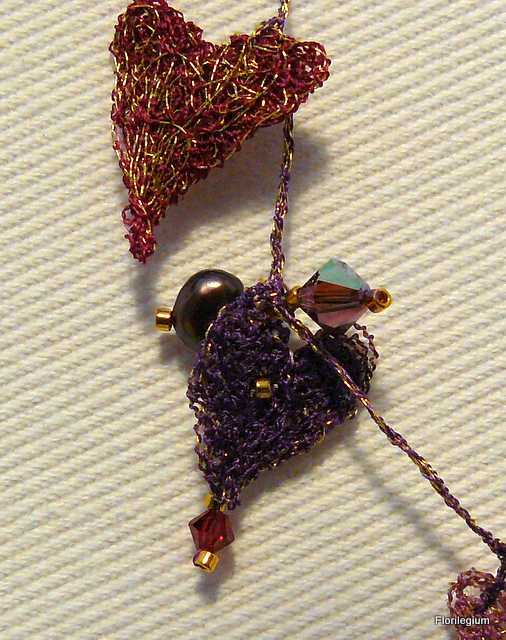 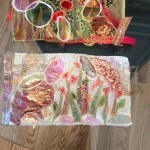 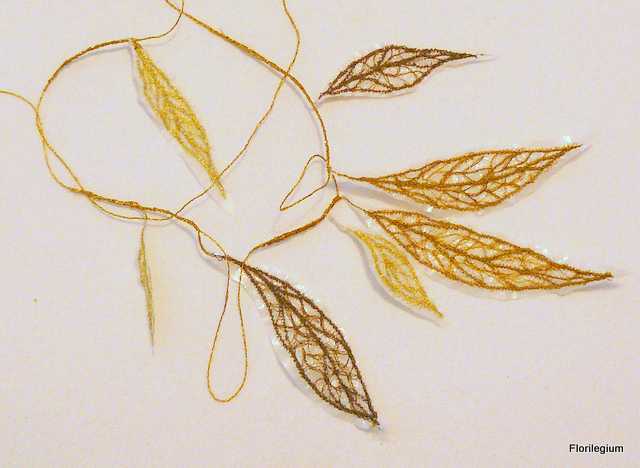 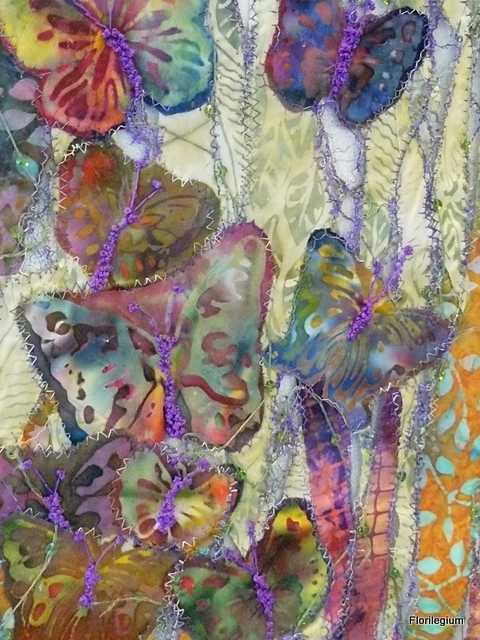 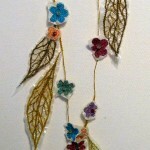 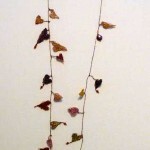 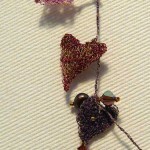 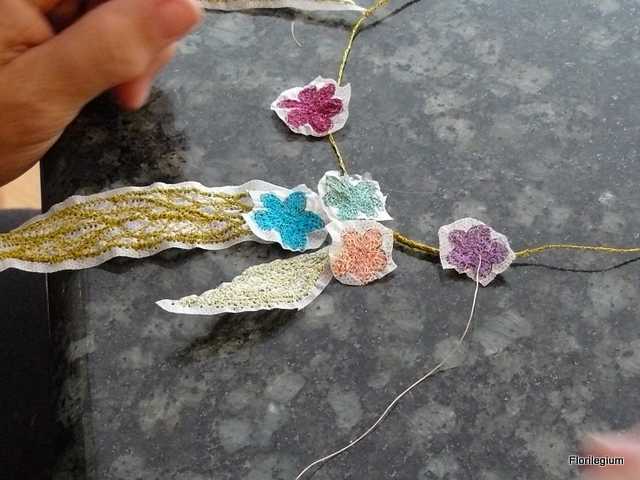 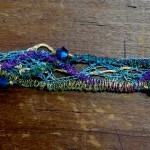 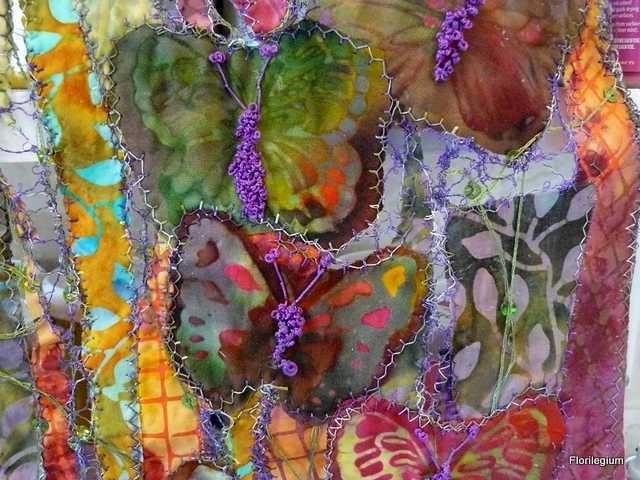 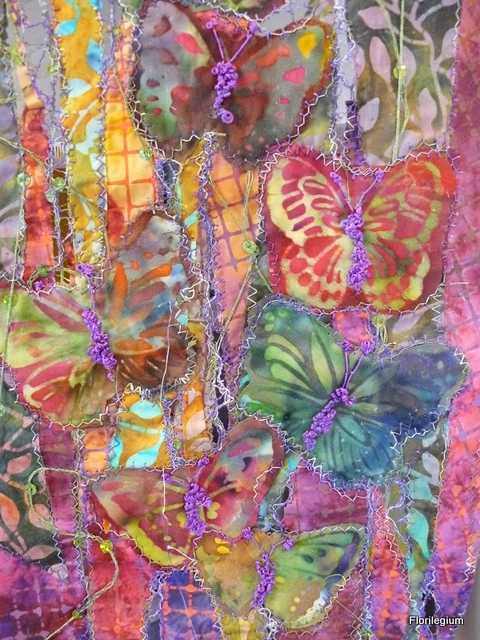 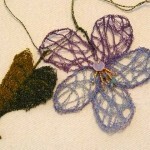 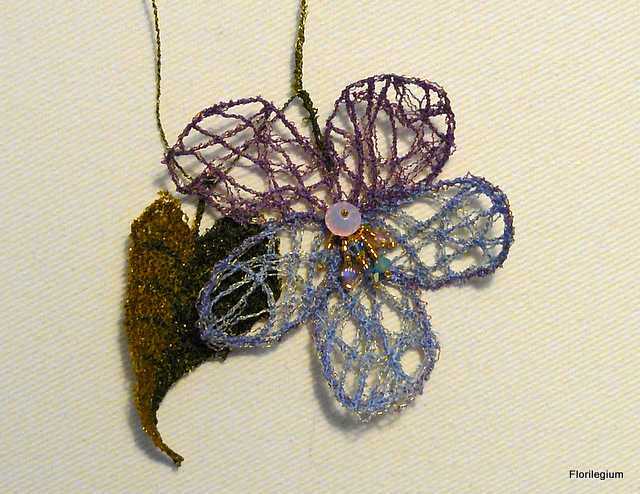 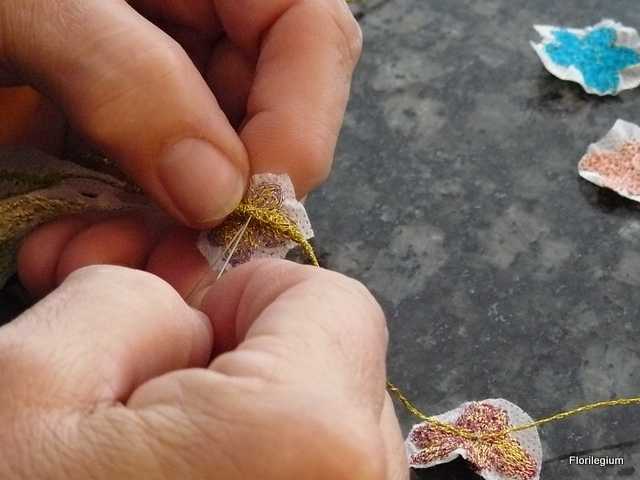 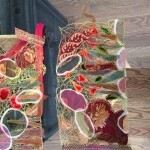 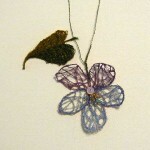 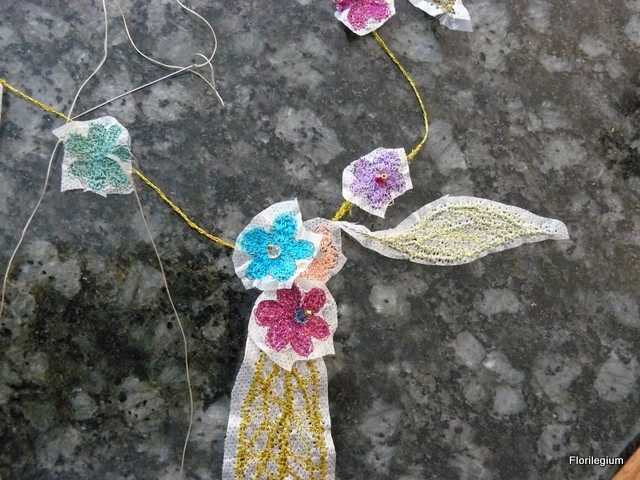 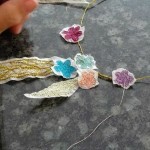 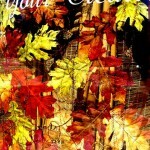 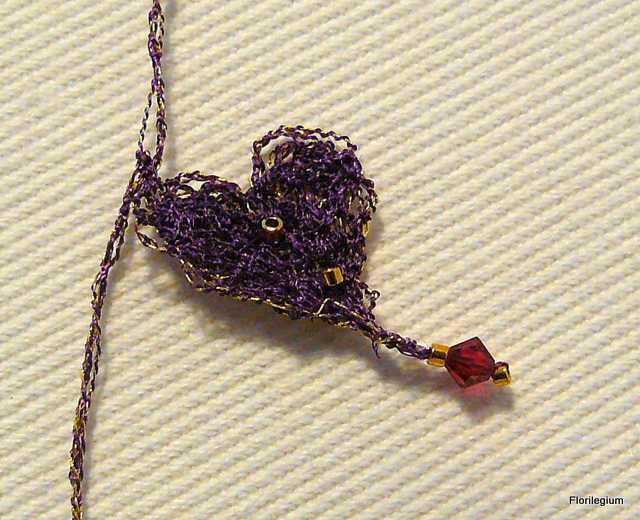 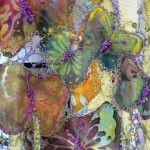 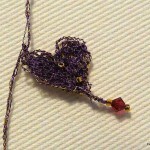 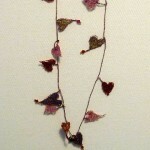 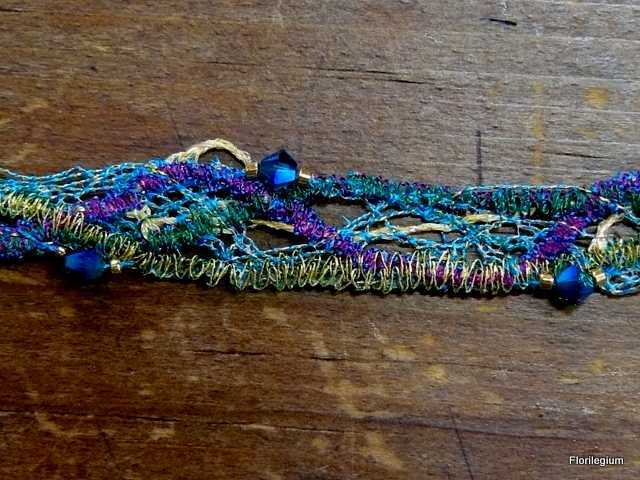 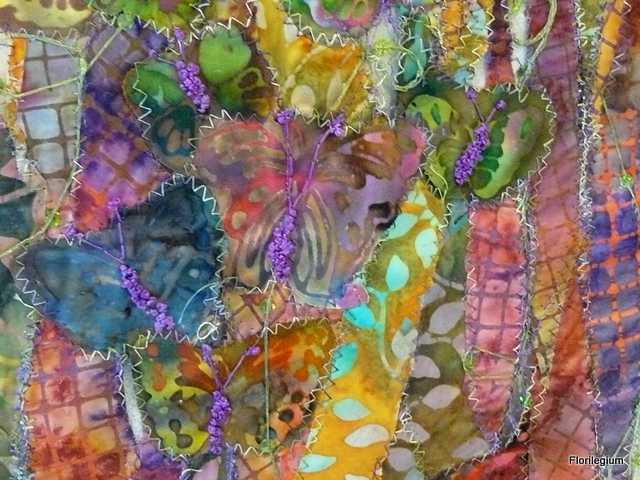 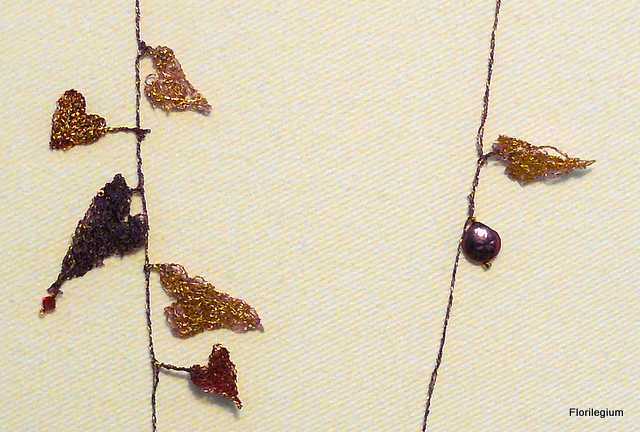 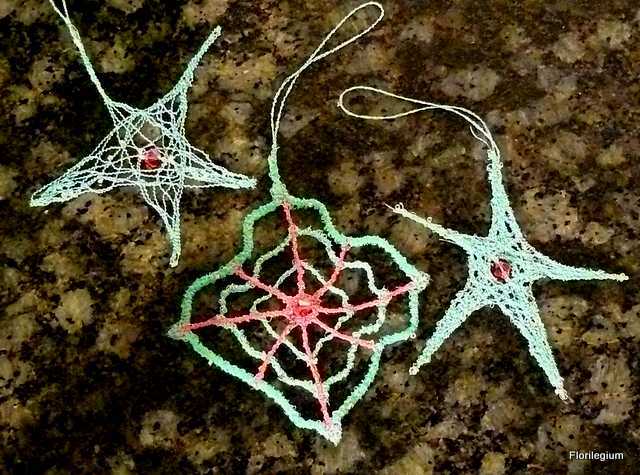 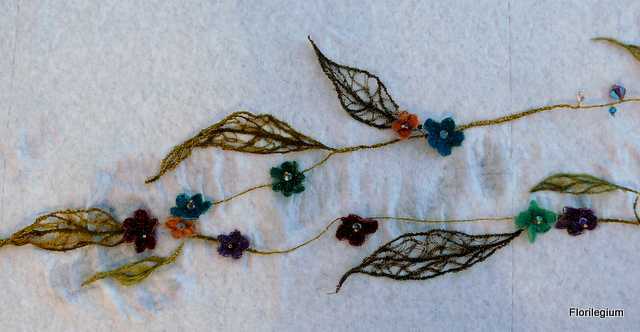 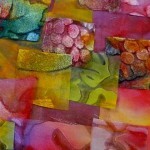 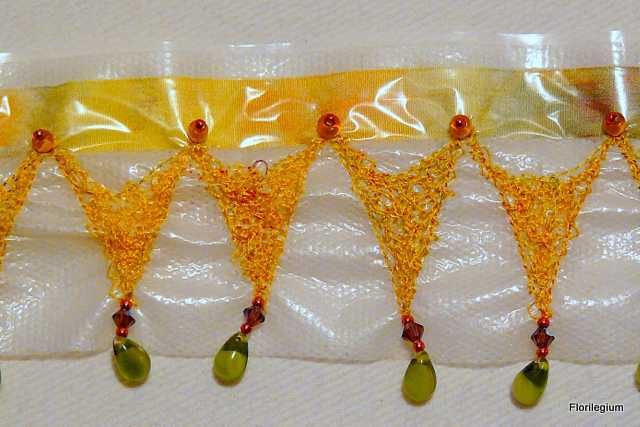 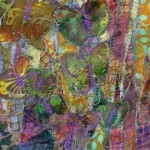 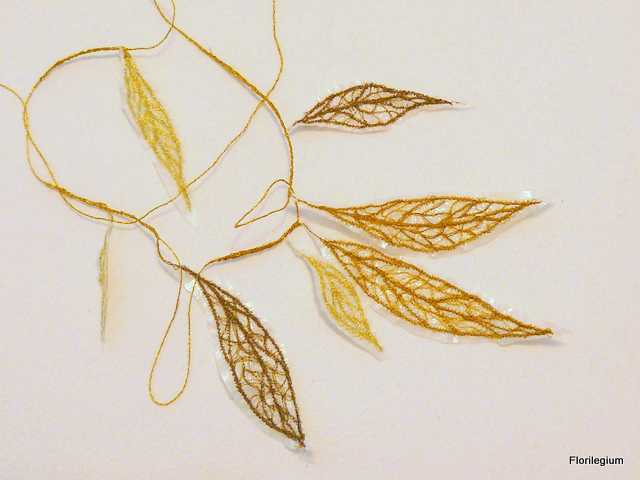 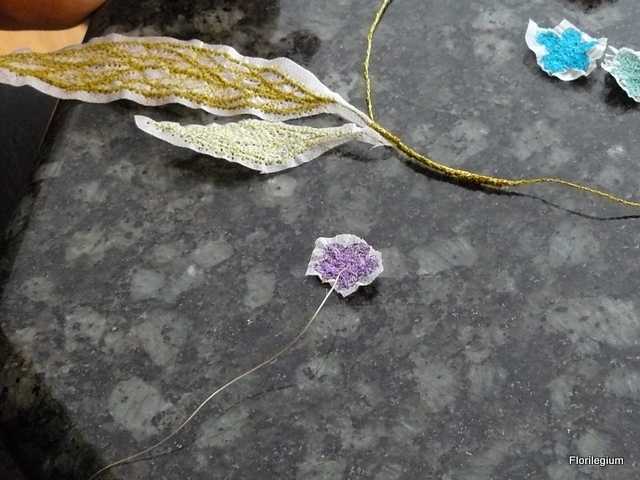 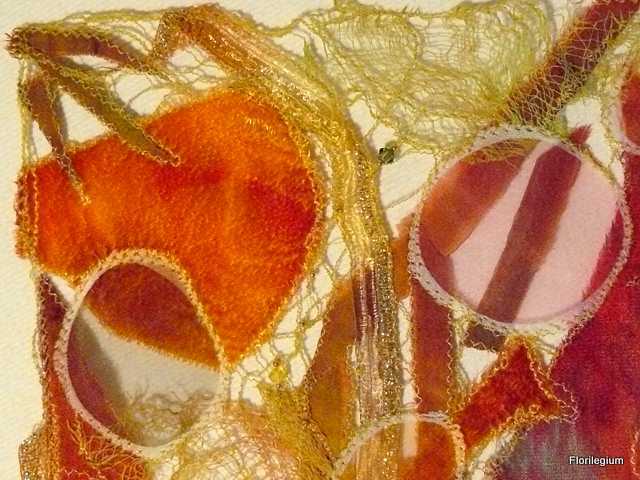 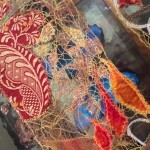 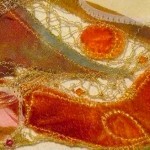 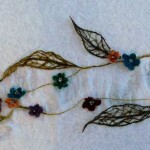 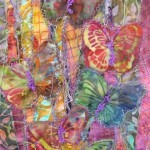 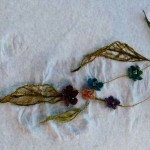 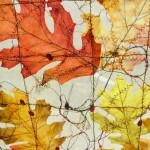 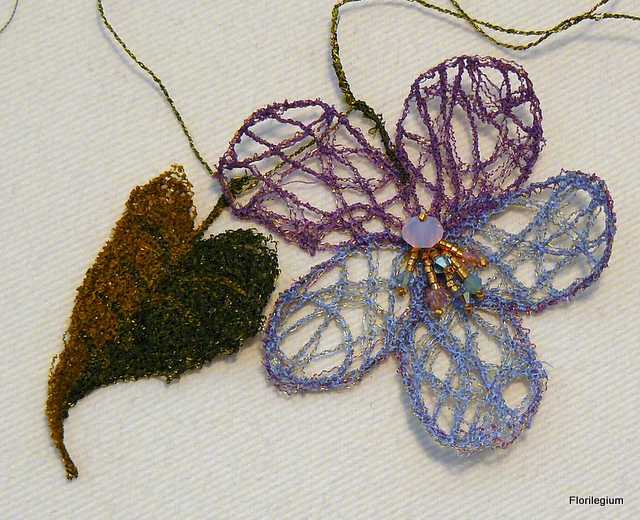 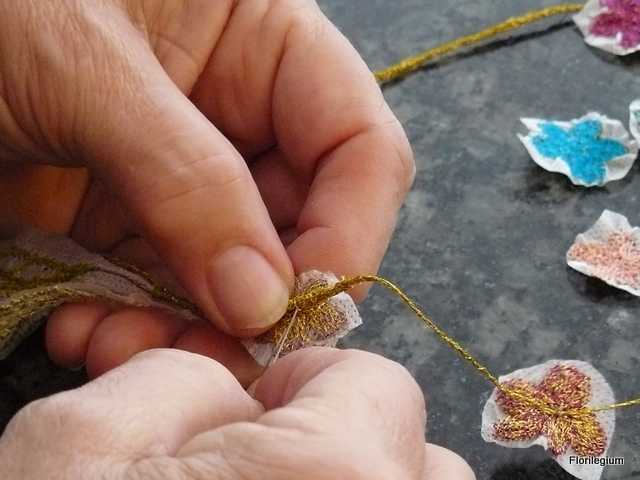 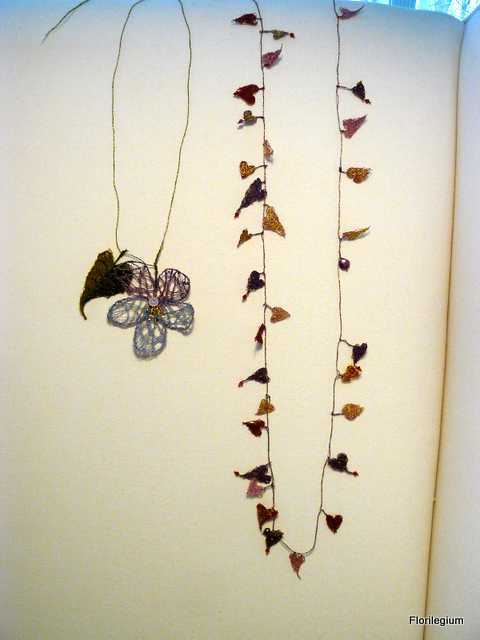 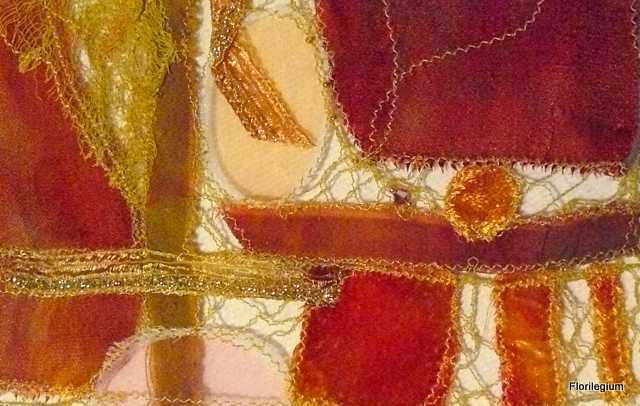 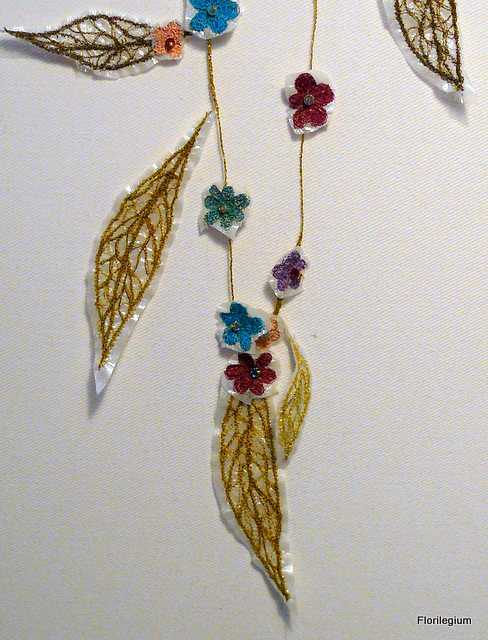 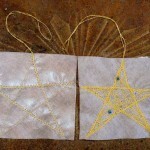 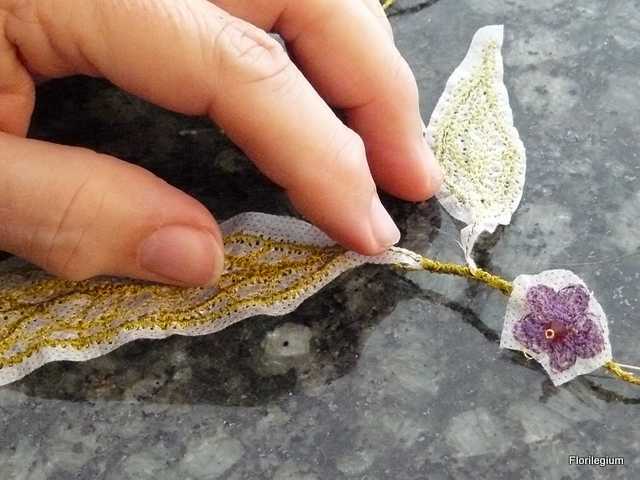 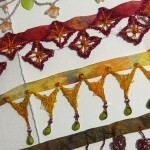 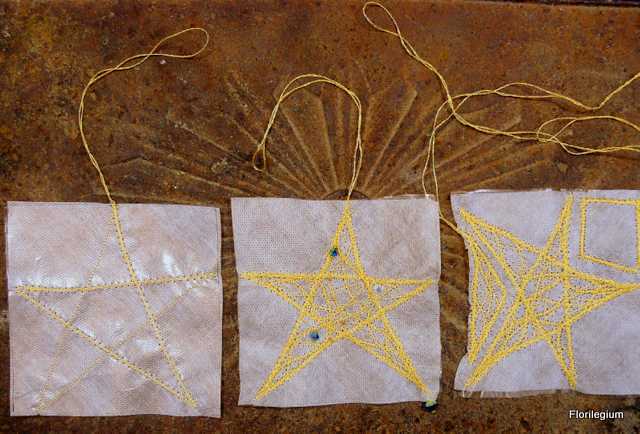 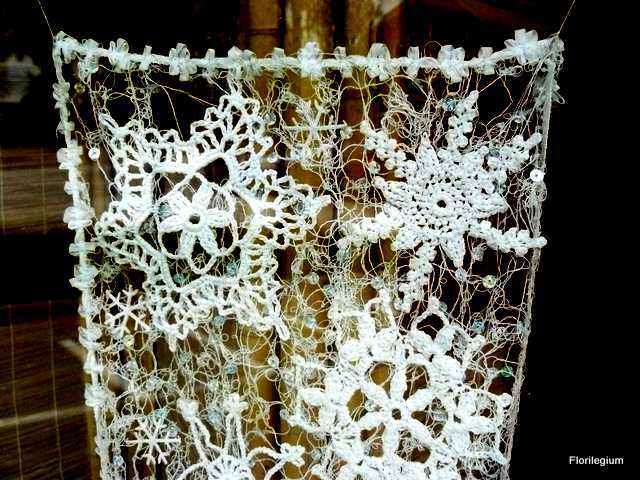 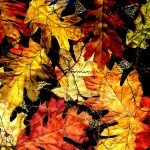 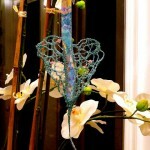 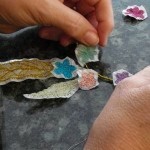 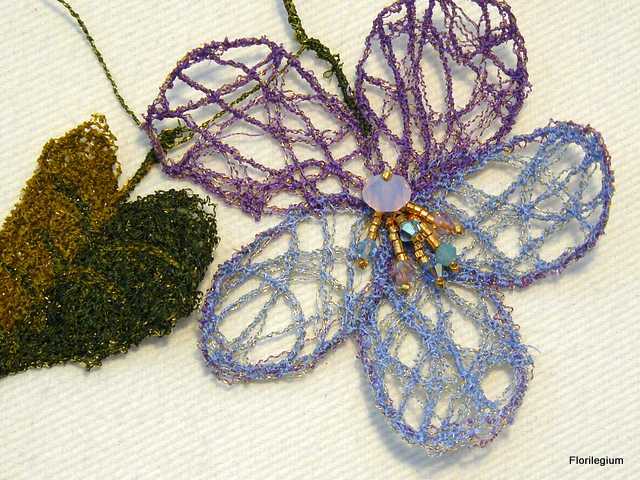 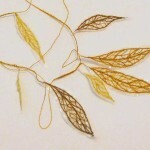 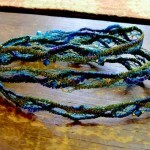 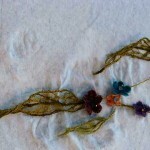 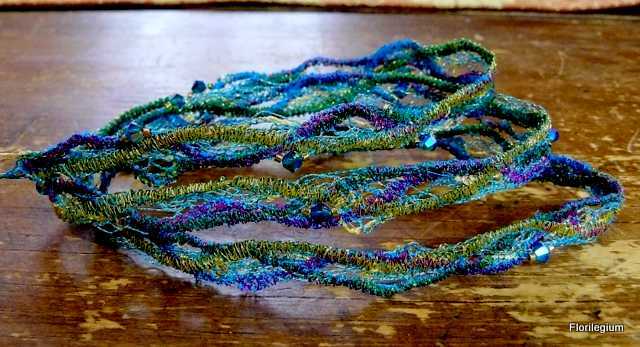 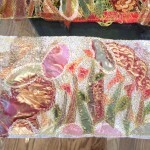 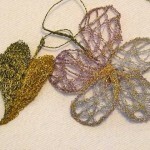 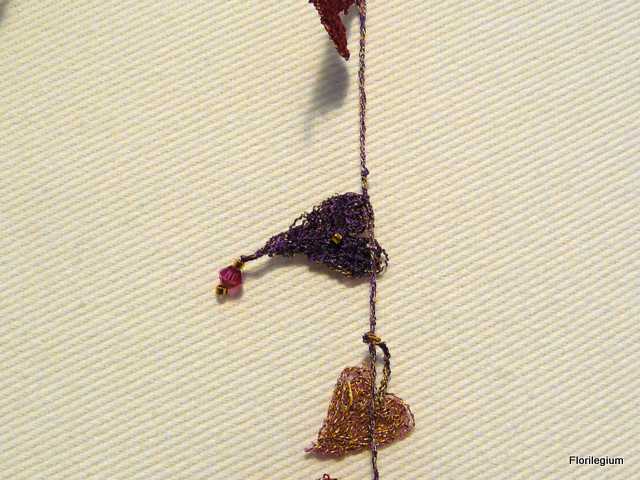 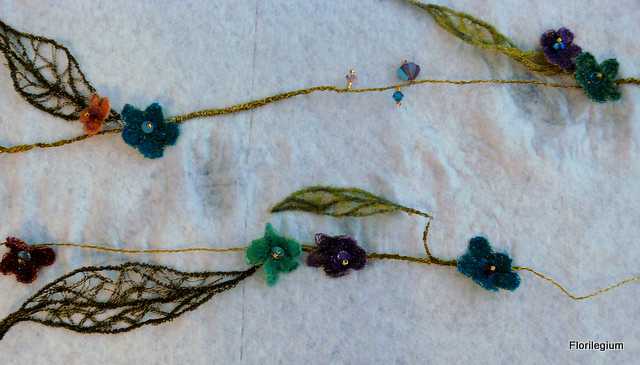 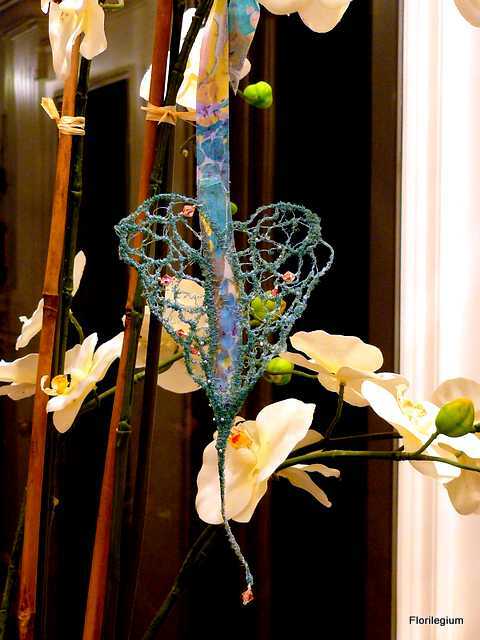 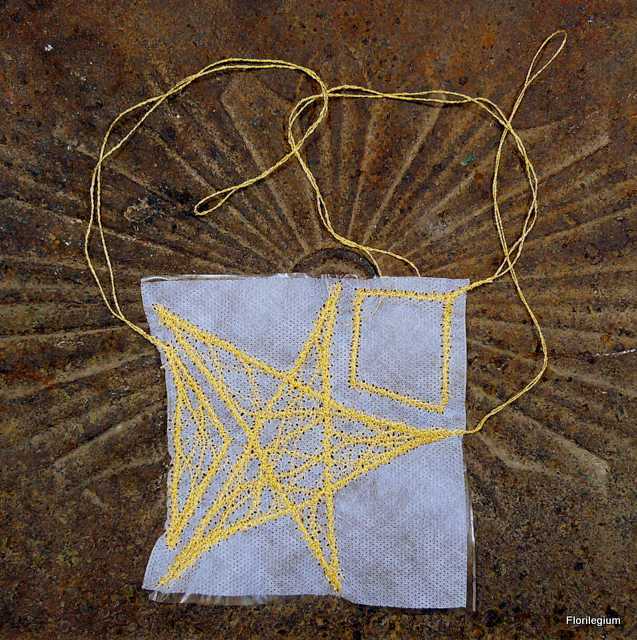 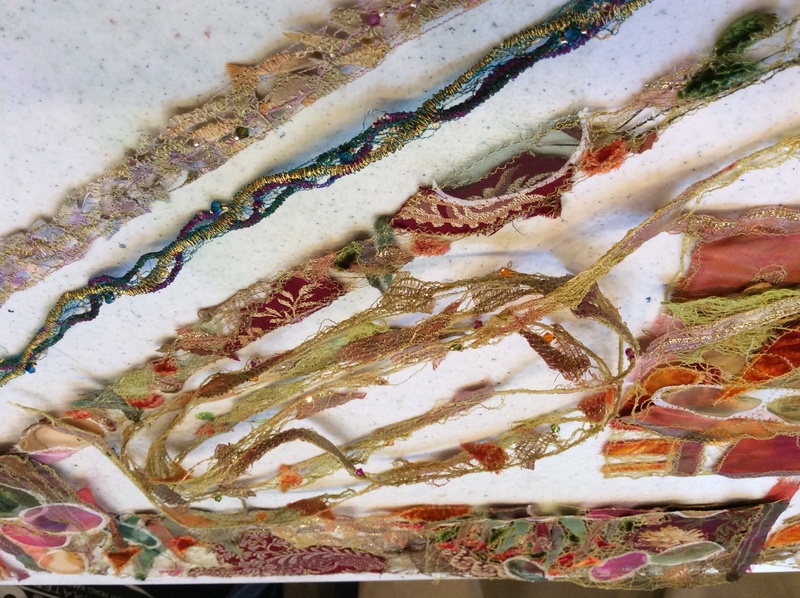 Beautiful embellishments can be made with stitch alone, or any combination of stitchable materials. 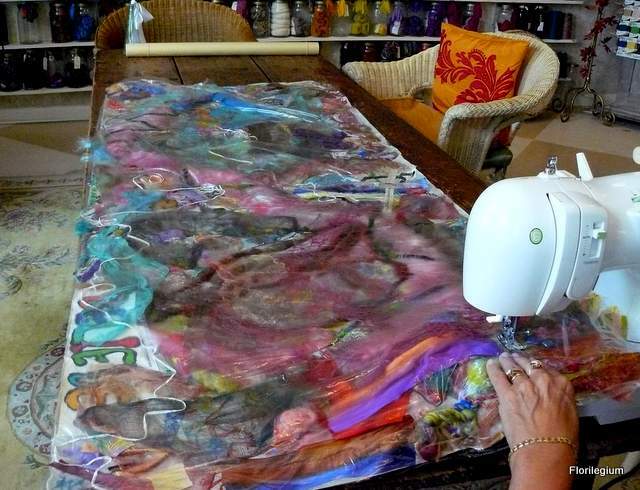 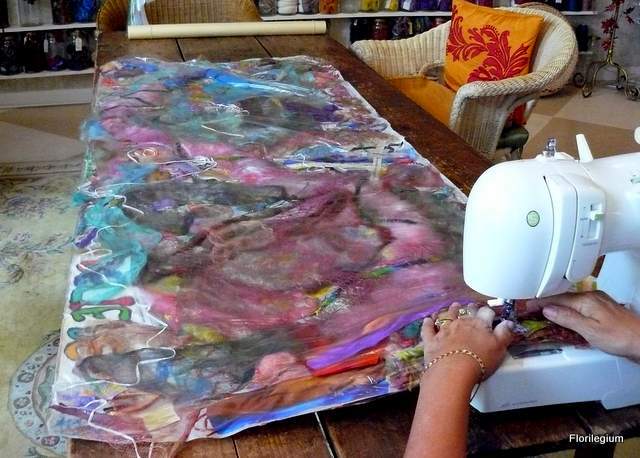 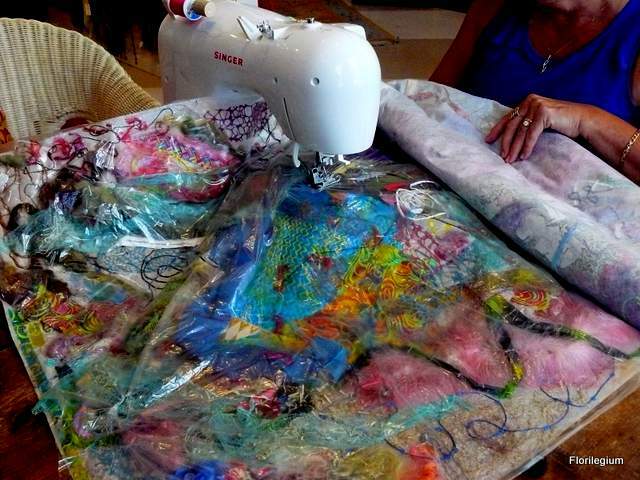 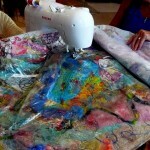 You will also need a sewing machine with thread, stitchable materials, and tap-water. 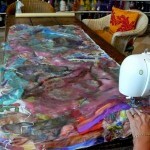 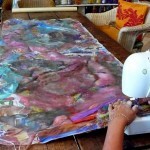 No complicated sewing is required!! 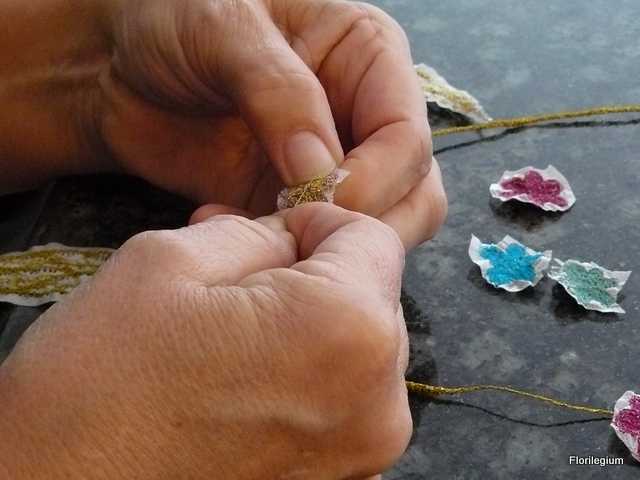 Complete instructions are included, below, so that you can see how easy this process is! 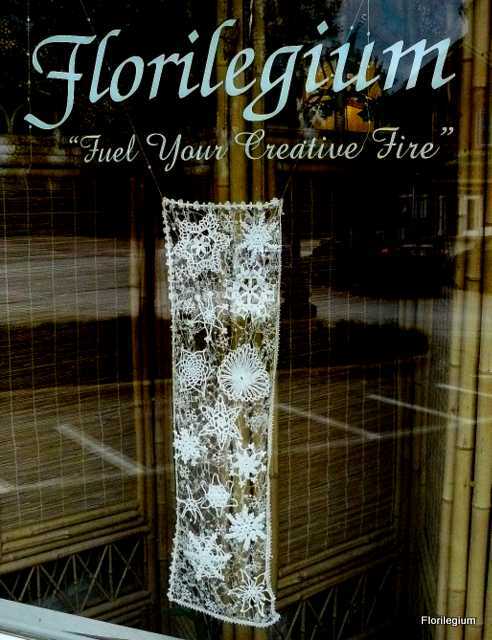 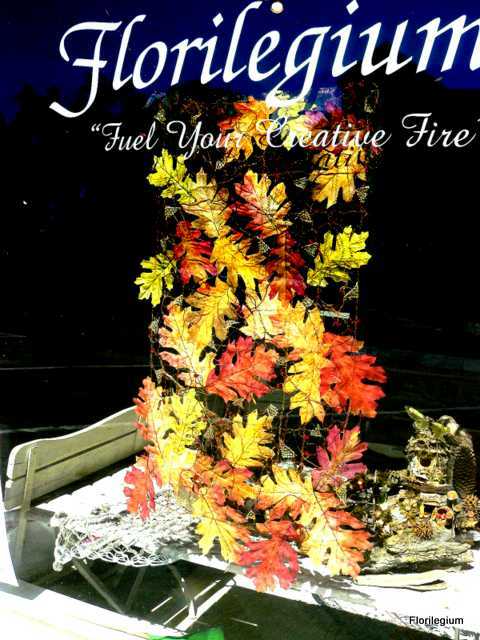 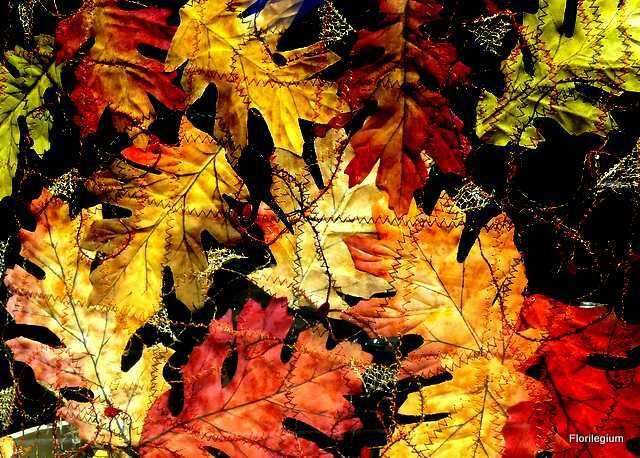 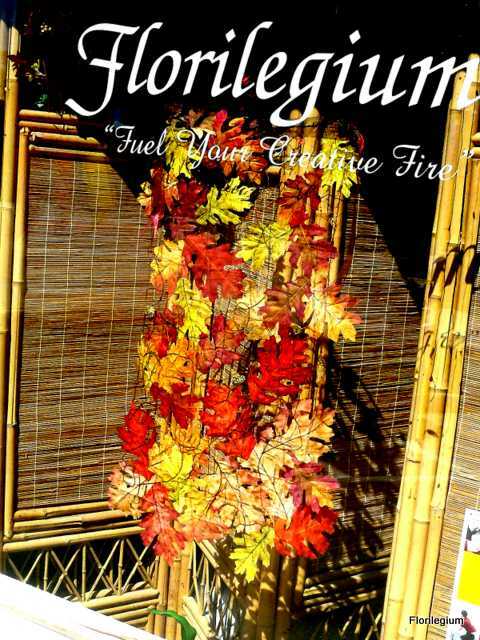 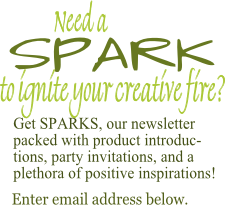 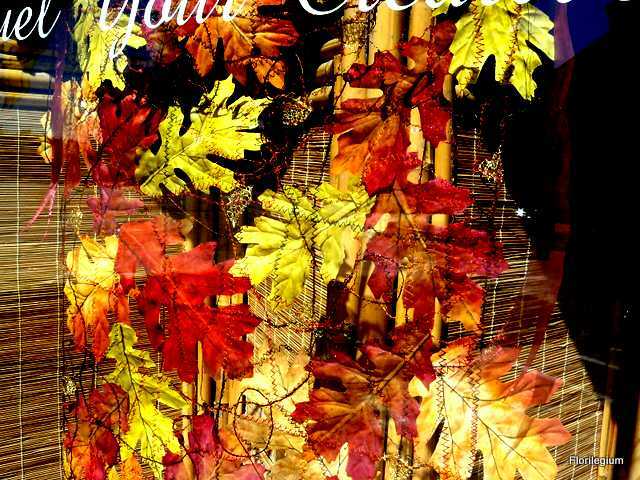 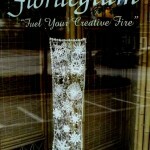 Email us with any questions floril@florilegium.com We would love to help! 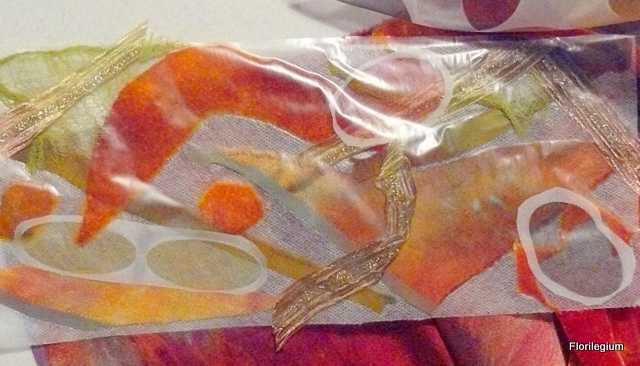 IMPORTANT: Freelace paper will begin to dissolve if even a drop of liquid touches it, so PLEASE do not set a cold drink on your work table!!! 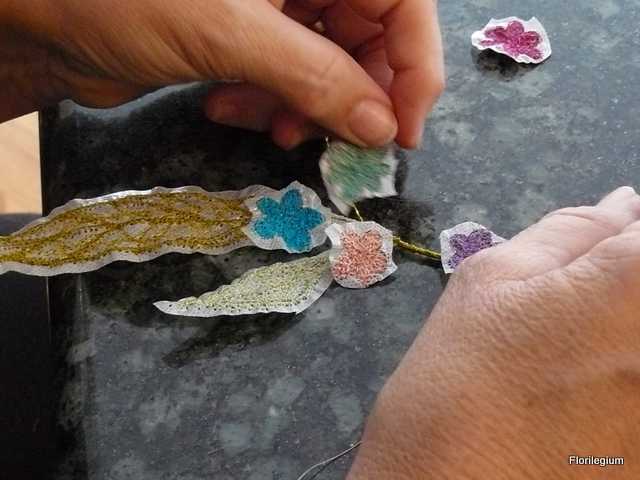 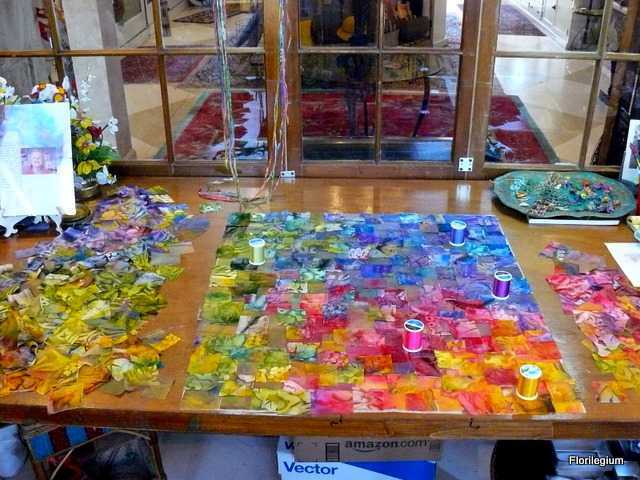 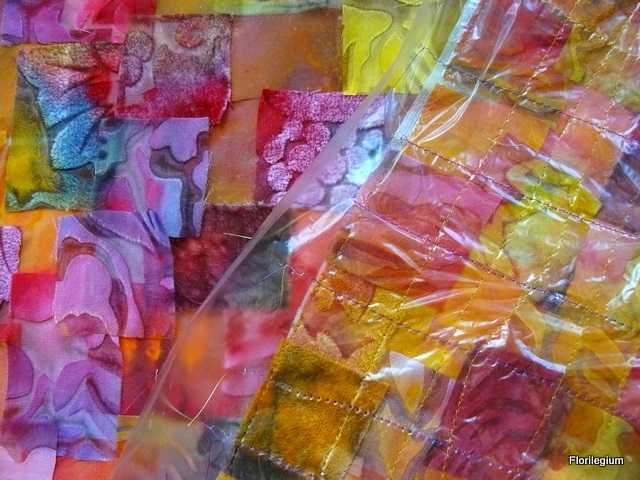 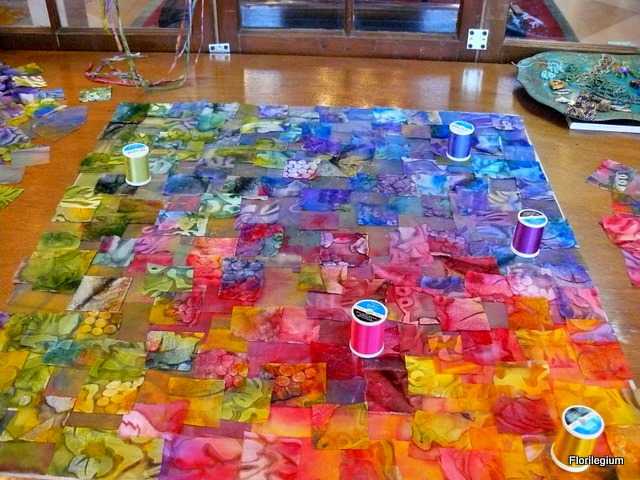 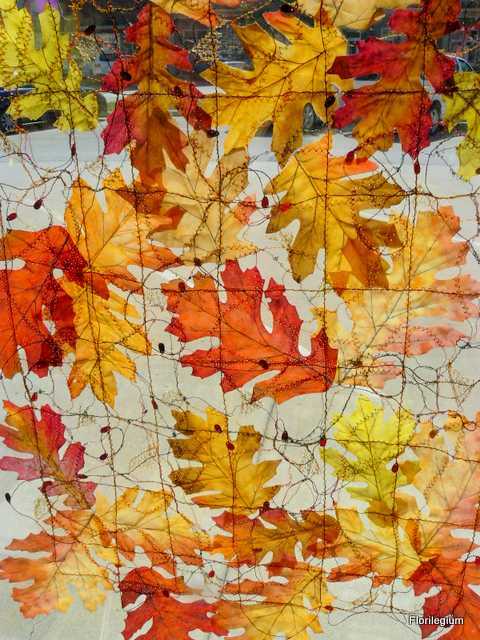 When you’re happy with your pattern, place the clear sheet over the top creating a “sandwich” (sticky paper, fibers, clear paper). 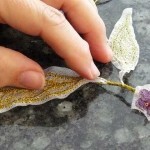 Smooth the surface with your hand, sticking the top layer down wherever the sticky surface is still exposed. 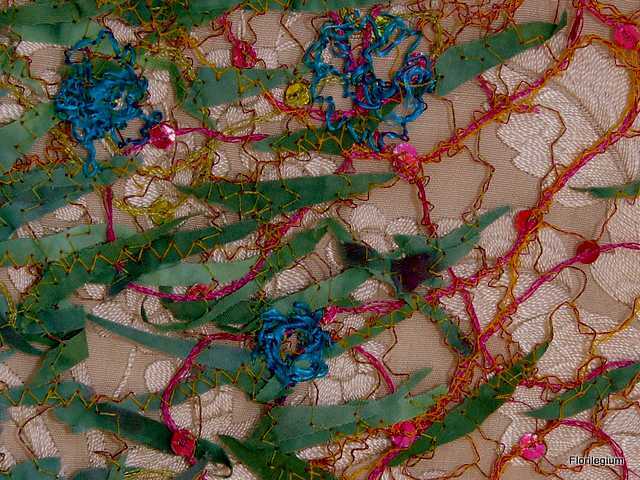 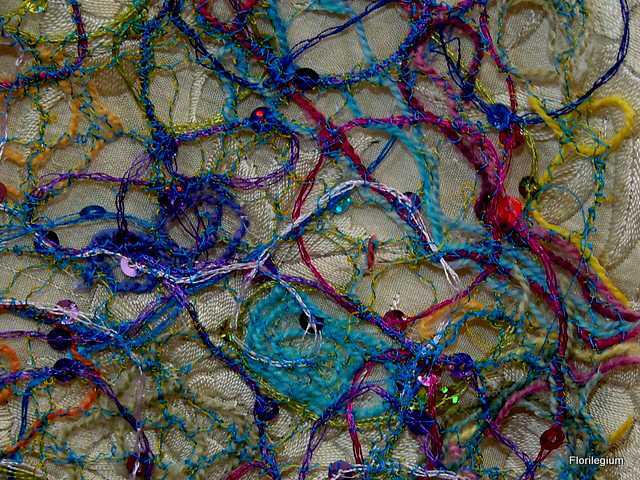 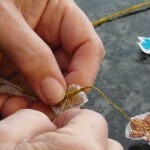 Stitch through the sandwich in any way that connects all of your fibers. 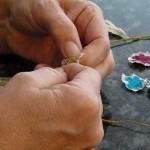 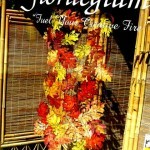 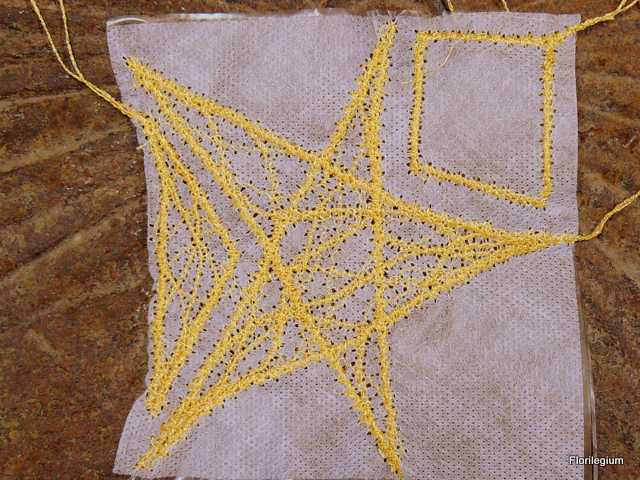 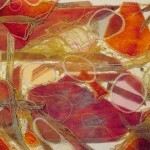 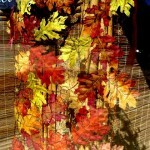 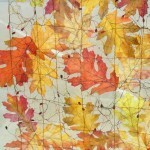 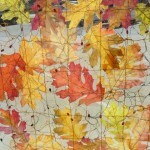 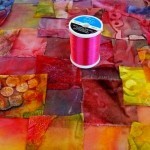 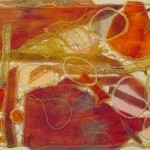 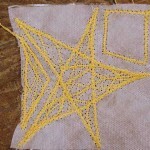 You can stitch grids, swirls or zigzags over the surface using decorative, clear or plain thread. 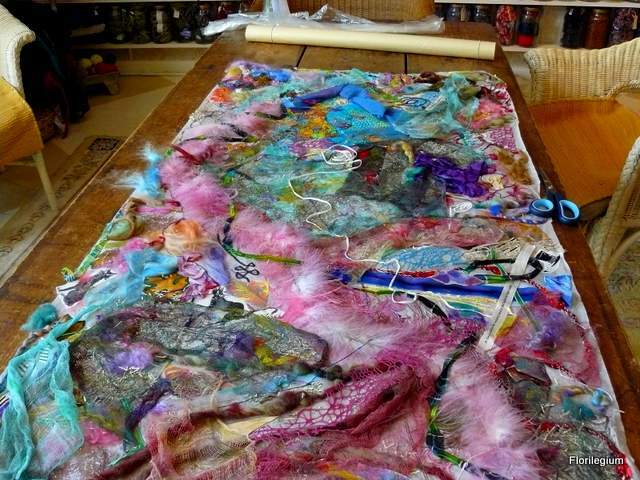 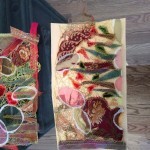 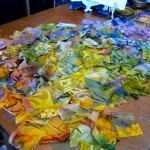 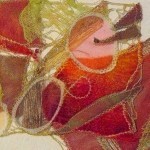 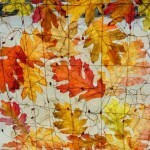 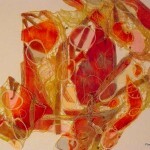 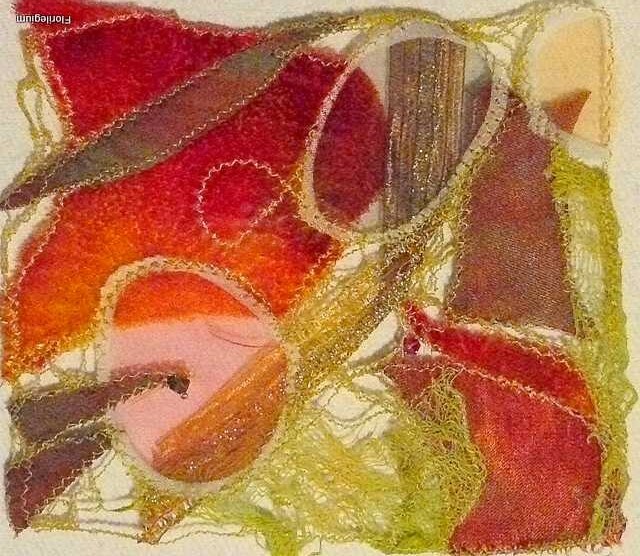 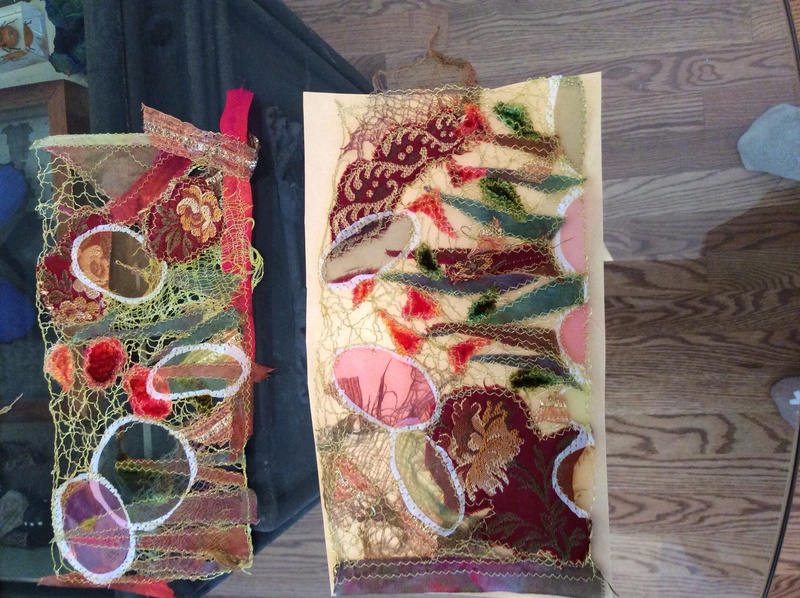 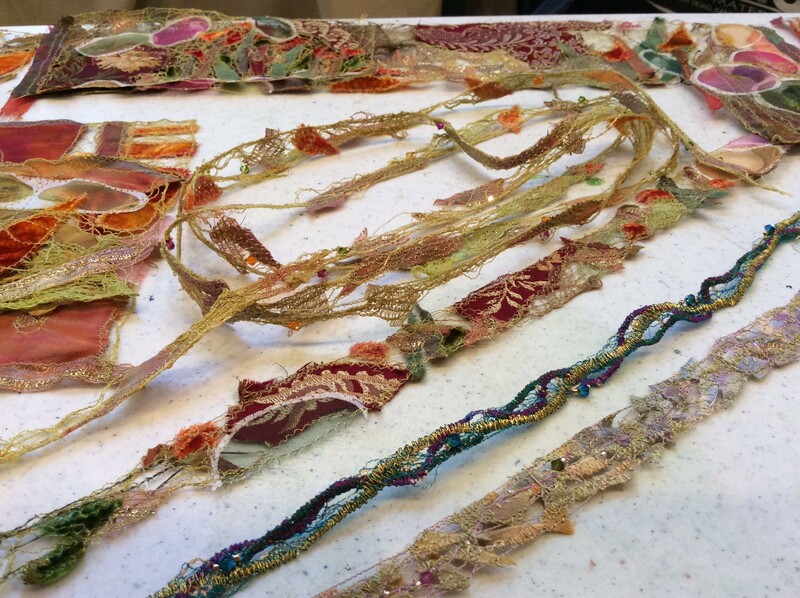 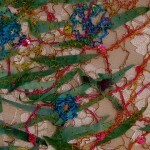 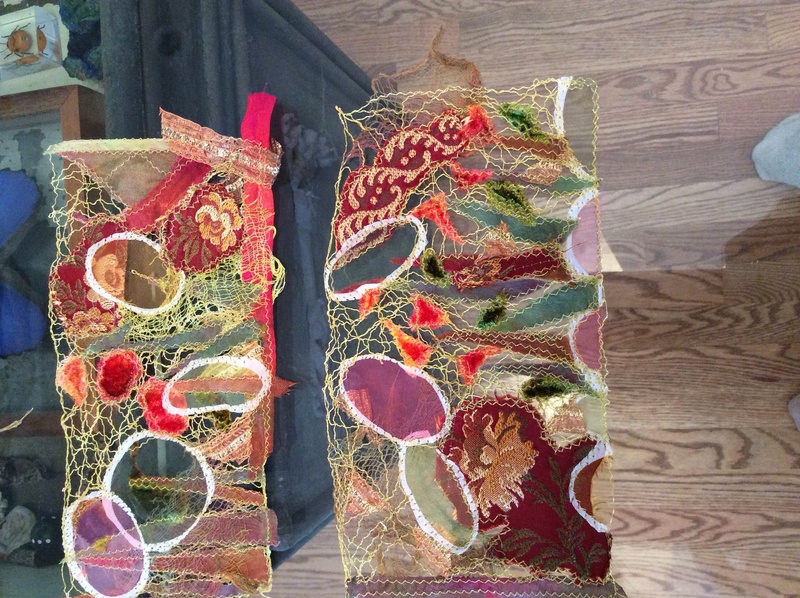 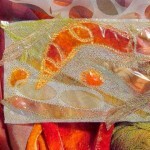 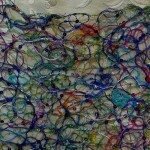 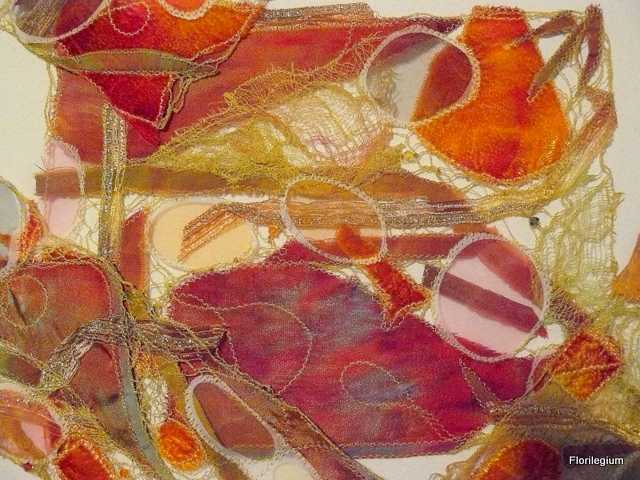 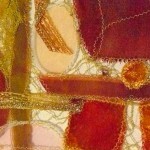 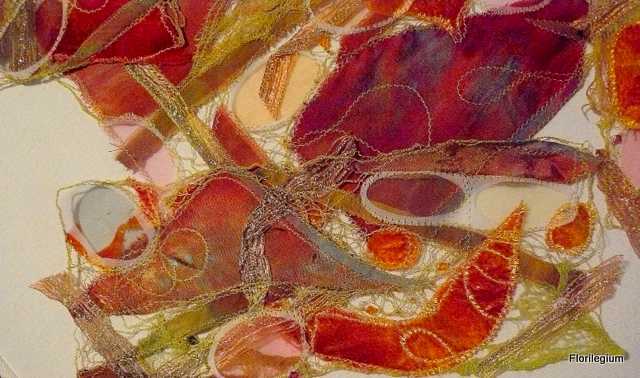 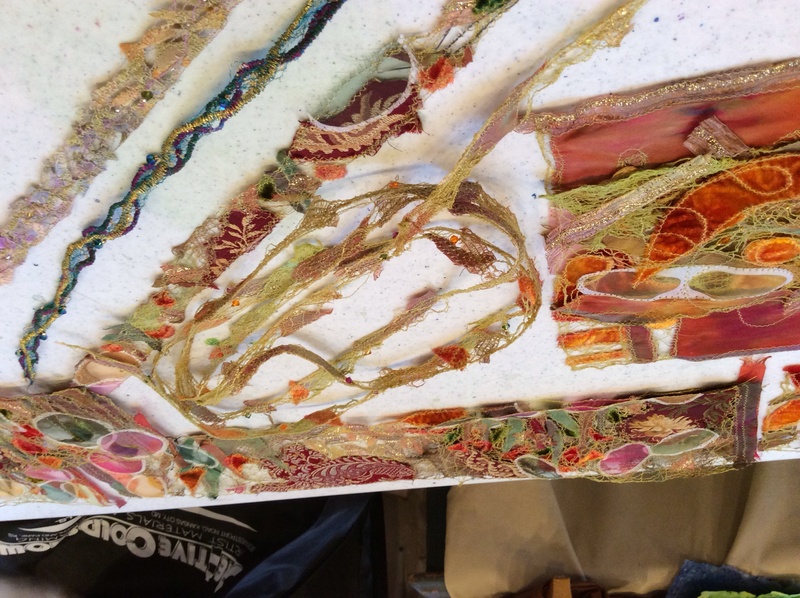 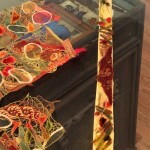 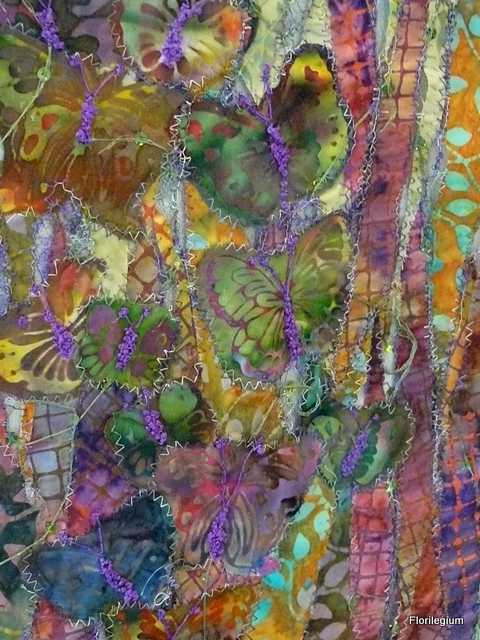 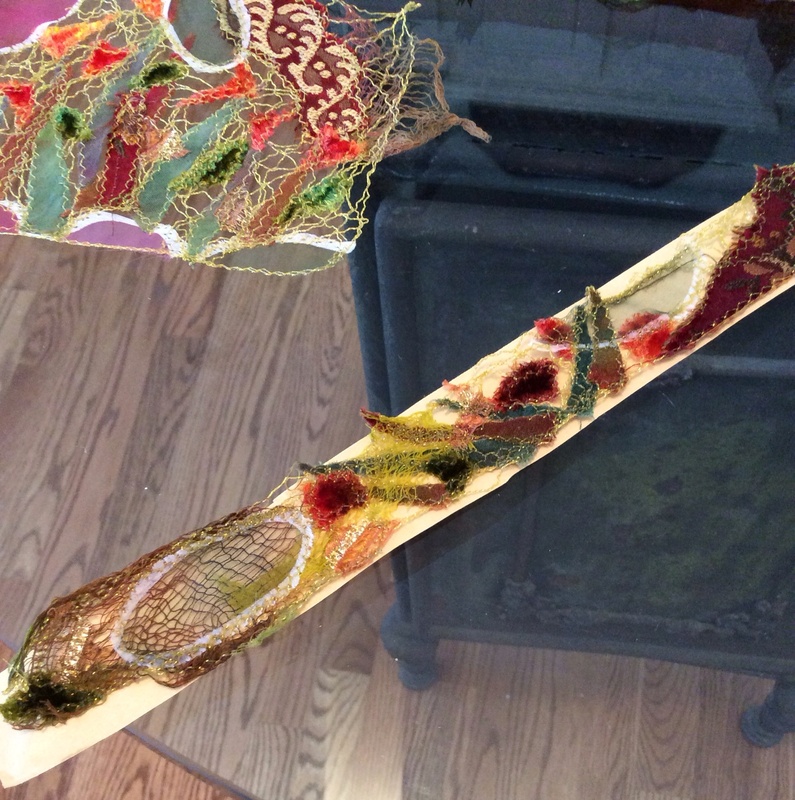 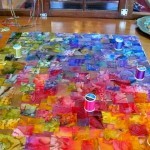 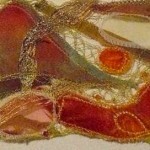 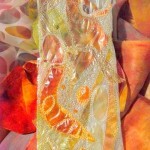 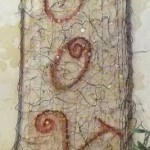 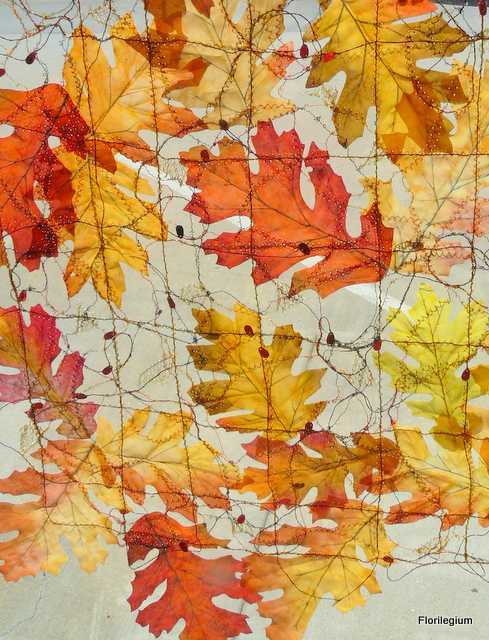 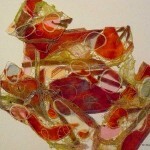 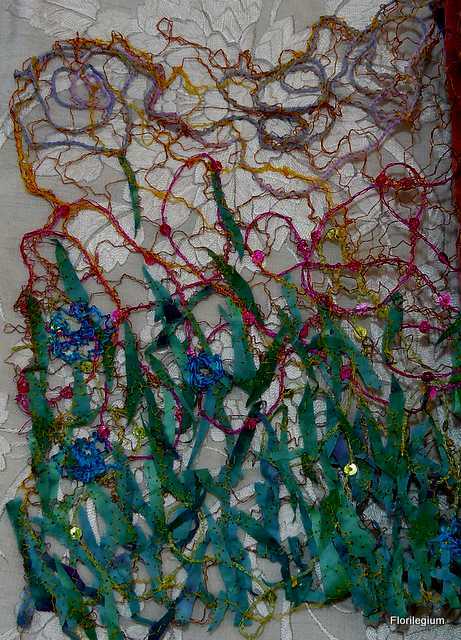 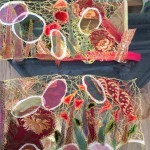 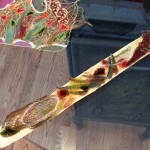 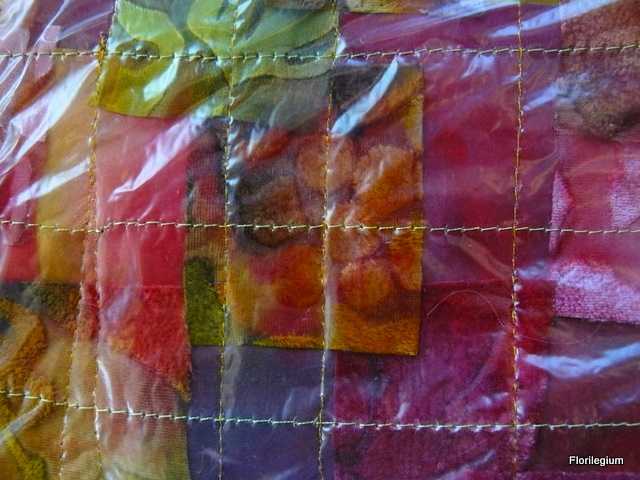 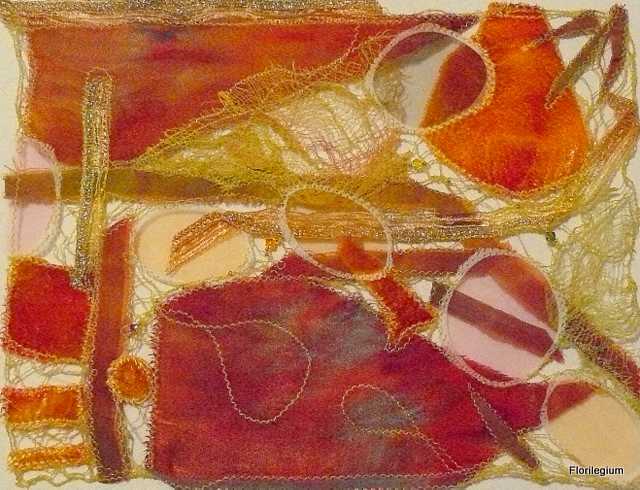 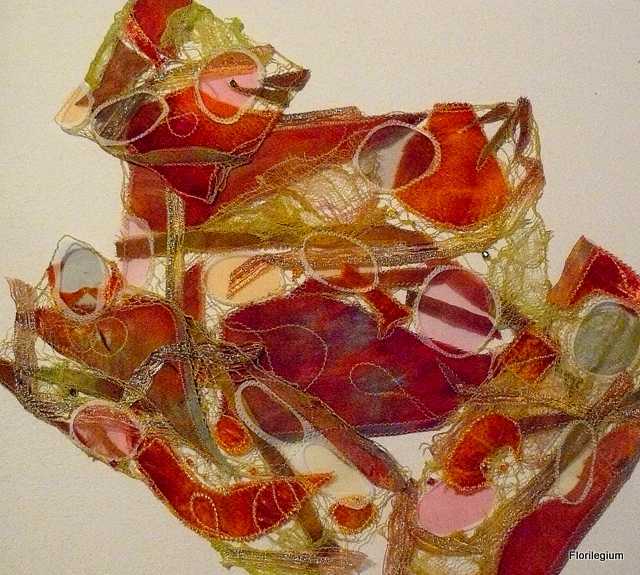 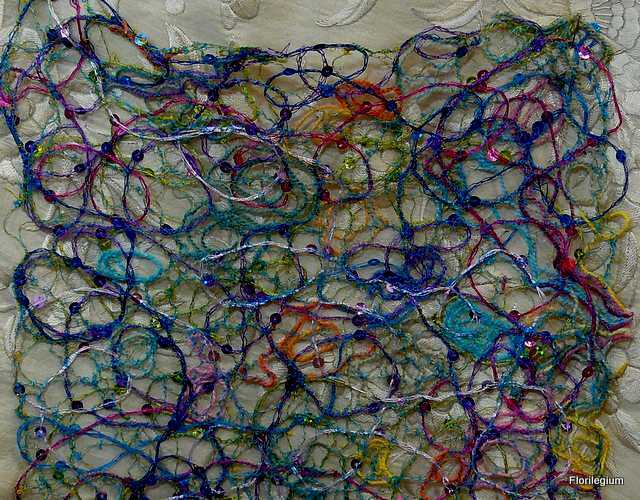 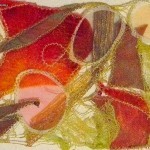 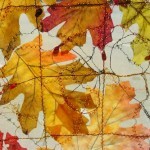 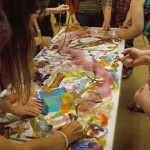 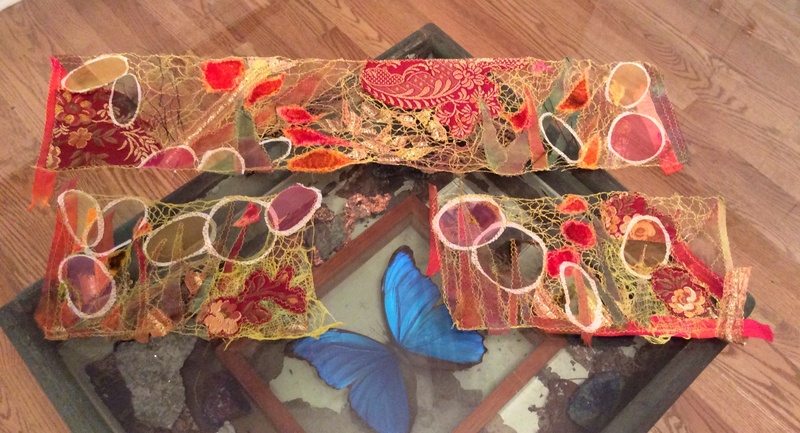 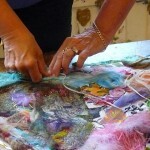 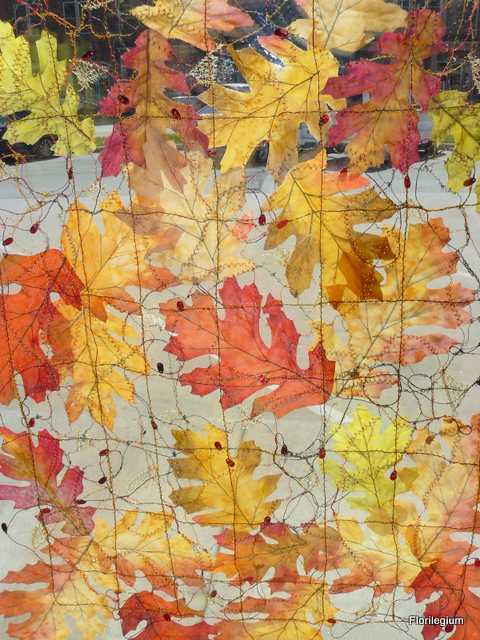 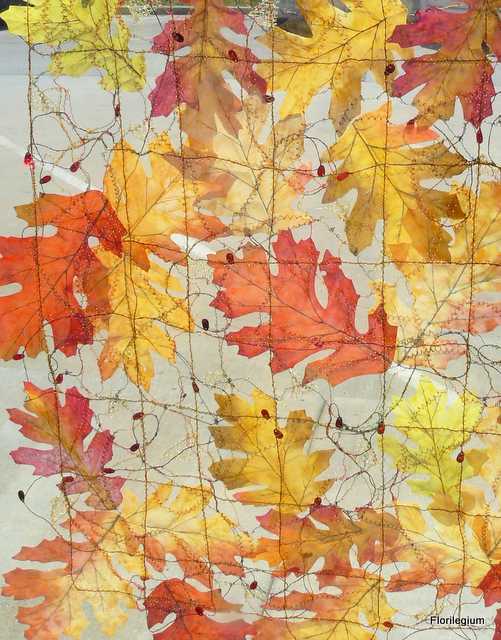 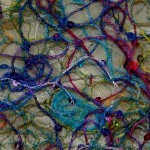 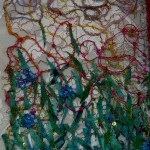 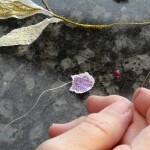 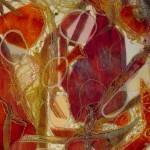 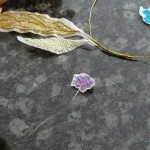 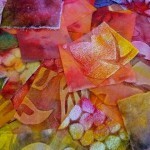 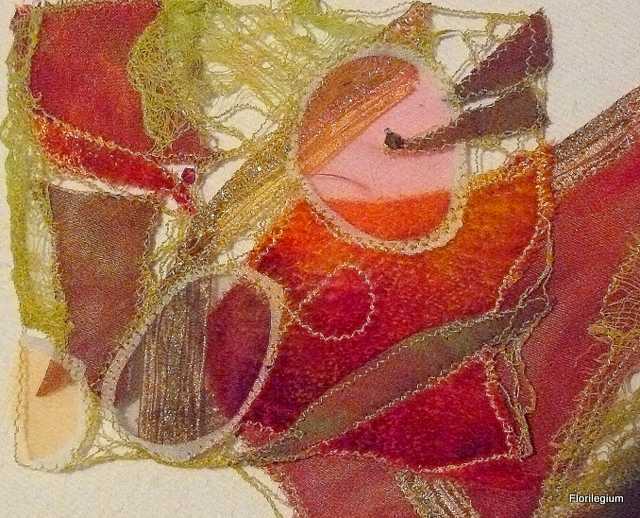 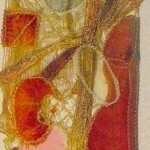 The stitching will be all that holds your work together once the paper is dissolved. 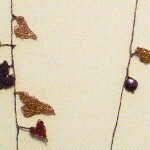 Your stitching can be unobtrusive or can provide additional design details. 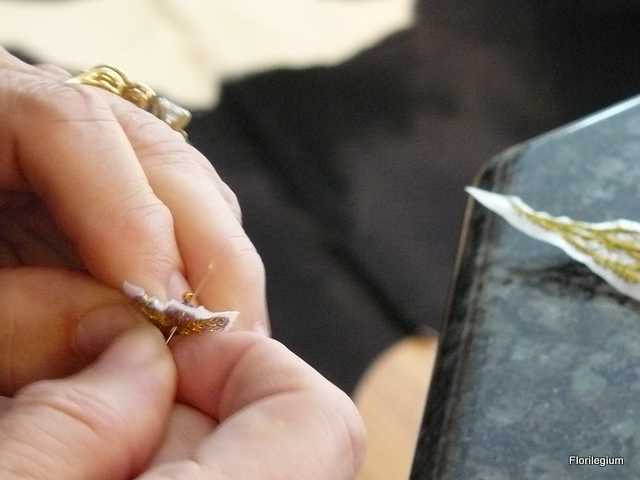 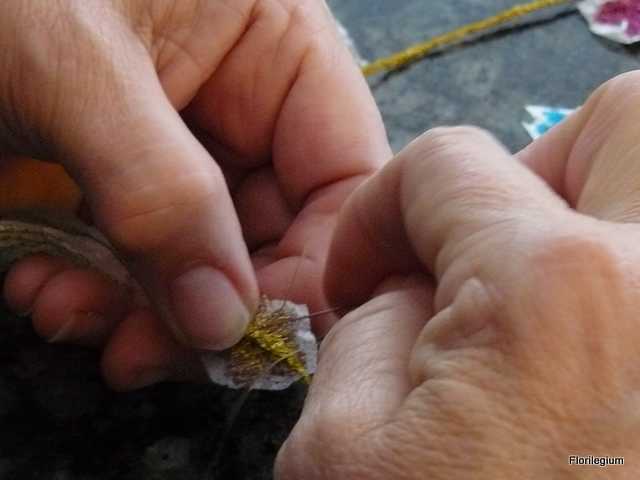 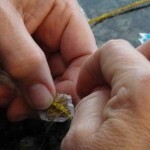 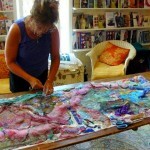 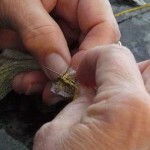 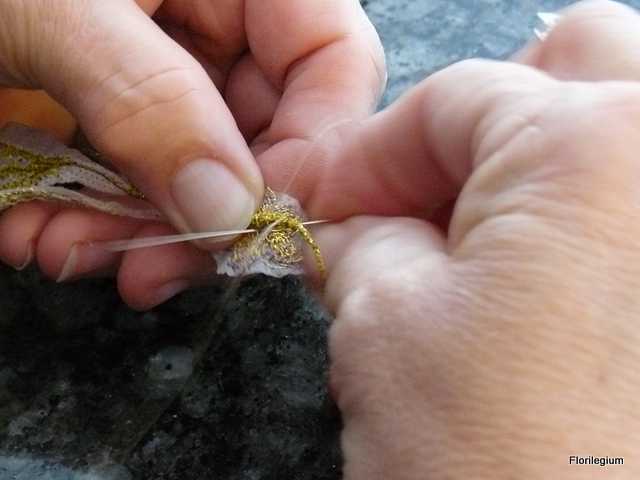 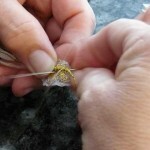 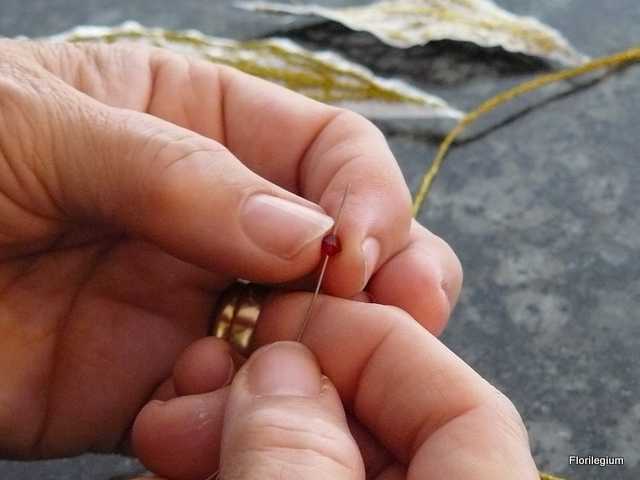 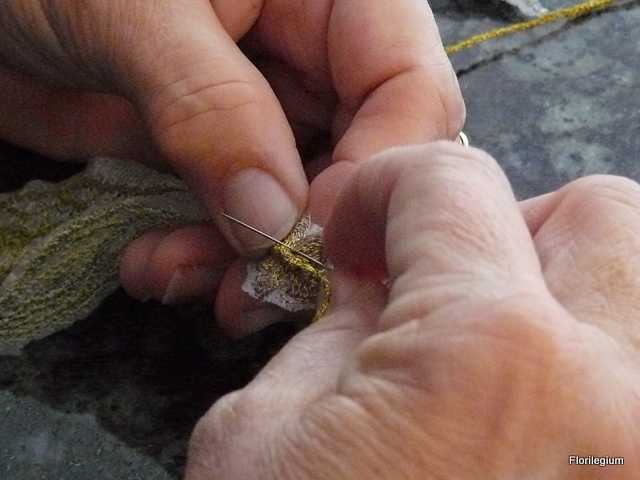 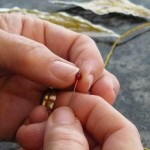 When the stitching is complete, place the entire piece into a sink or bowl full of tap water. 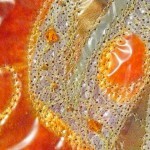 The temperature of the water is not important, so use cool to warm water that is comfortable to your hands. 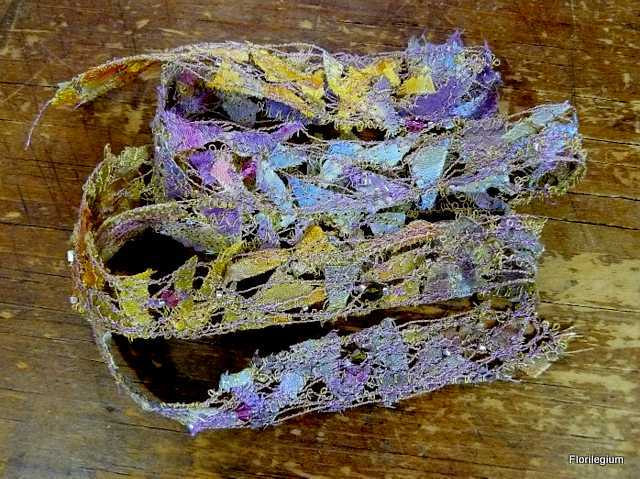 The papers will both begin to dissolve within a minute or so (continued rinsing for four minutes or so will remove the remaining starchy residue). 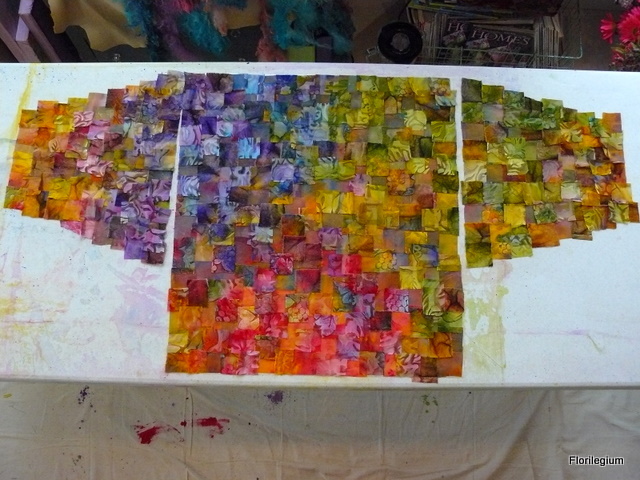 Less soaking will leave some starch in the piece and works well for wall hangings. 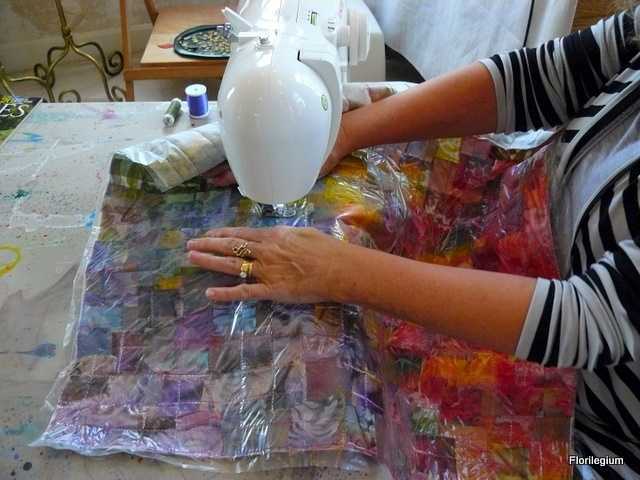 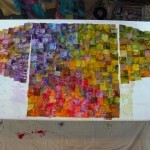 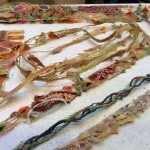 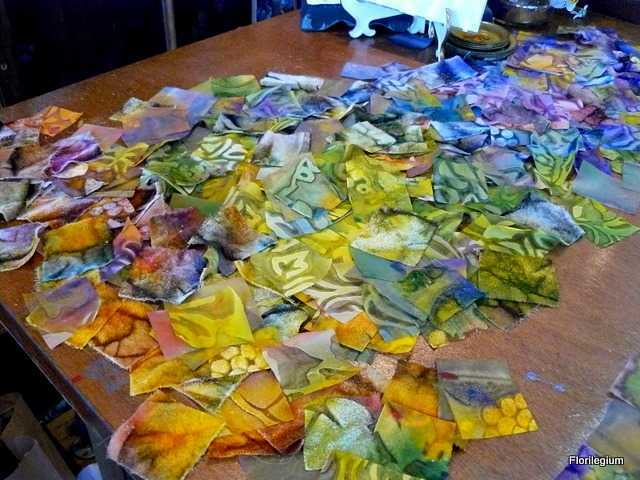 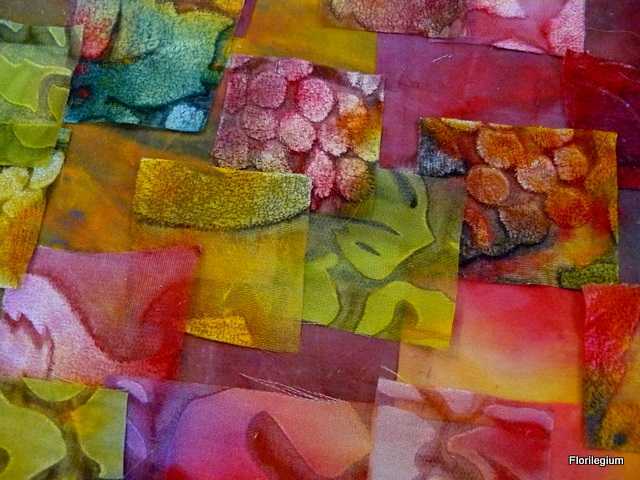 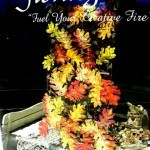 If you allow your piece to dry and find it is too stiff, you can rinse again. 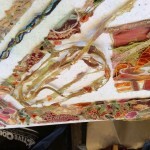 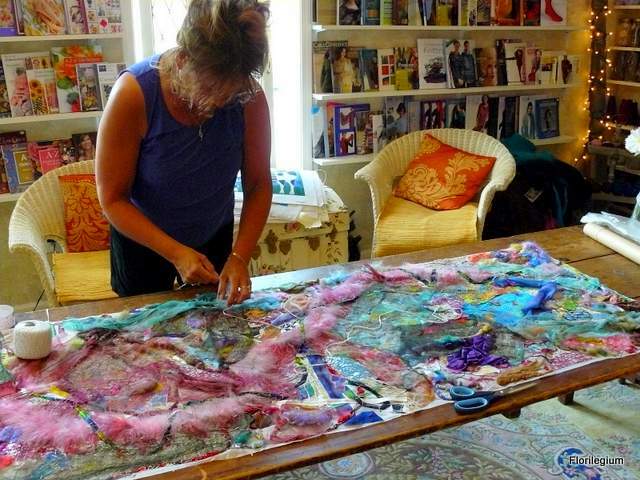 Laying out the Fibers, etc.